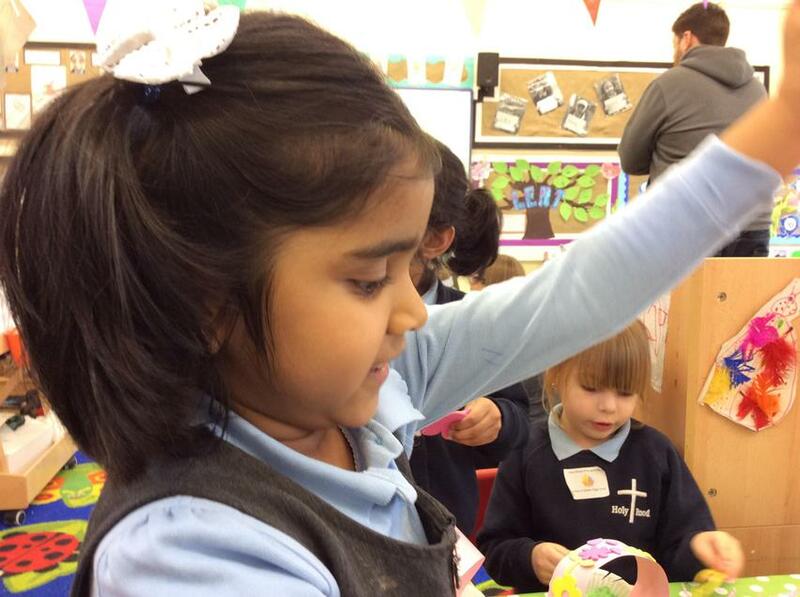 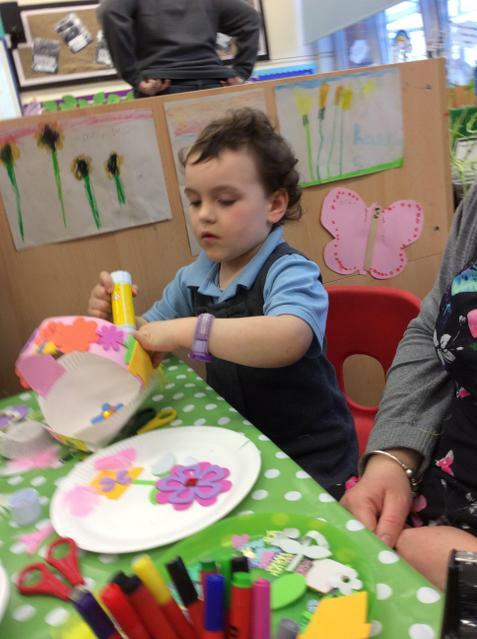 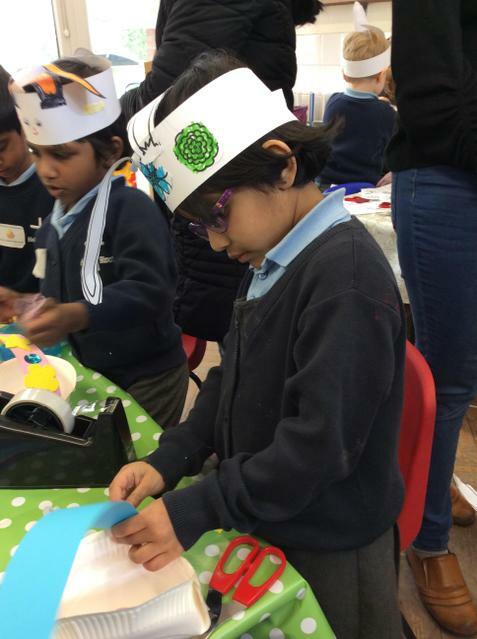 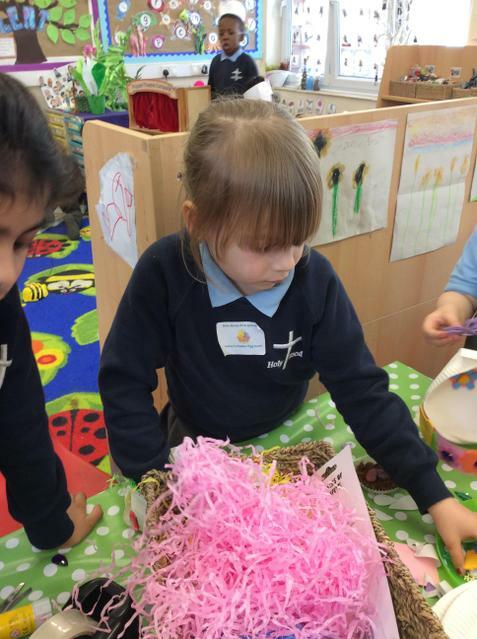 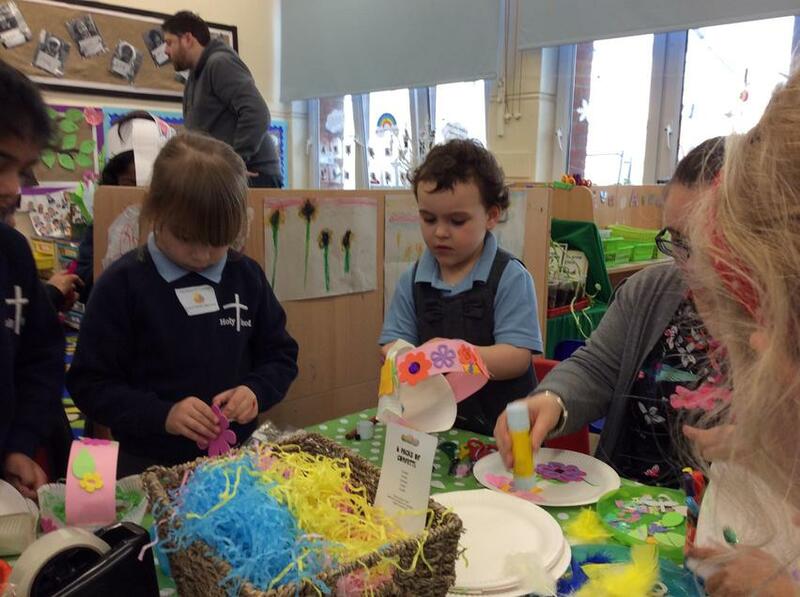 Easter Stay and Play A big thank you to all the parents who joined us for our Easter themed stay and play session. 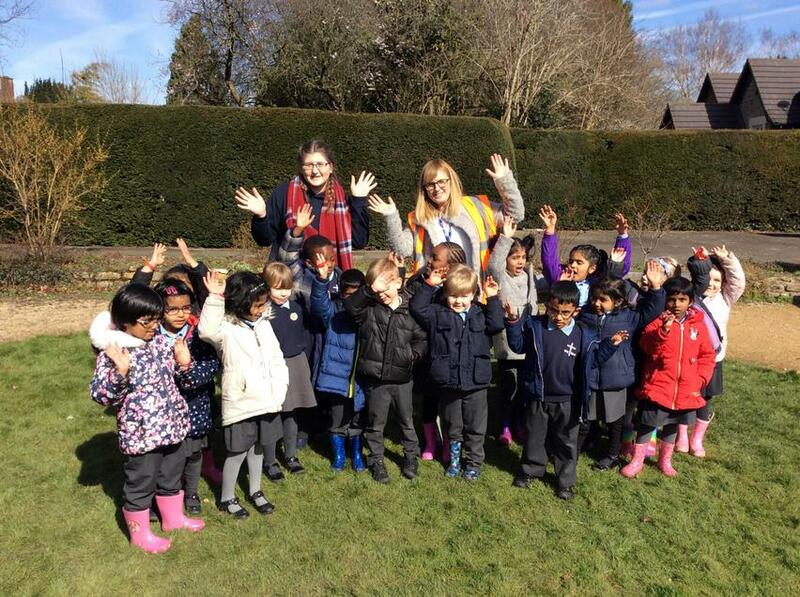 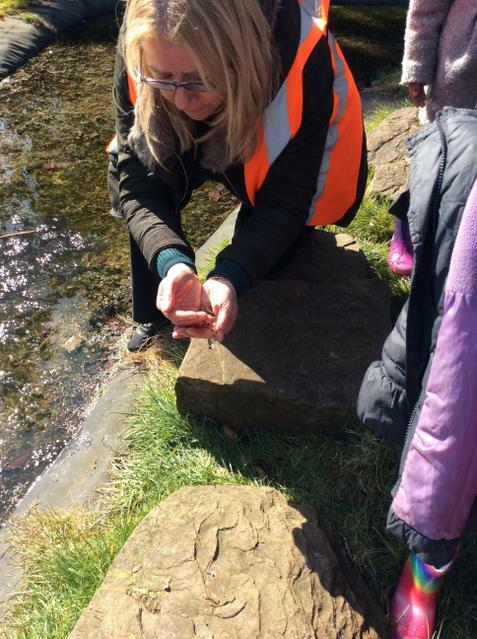 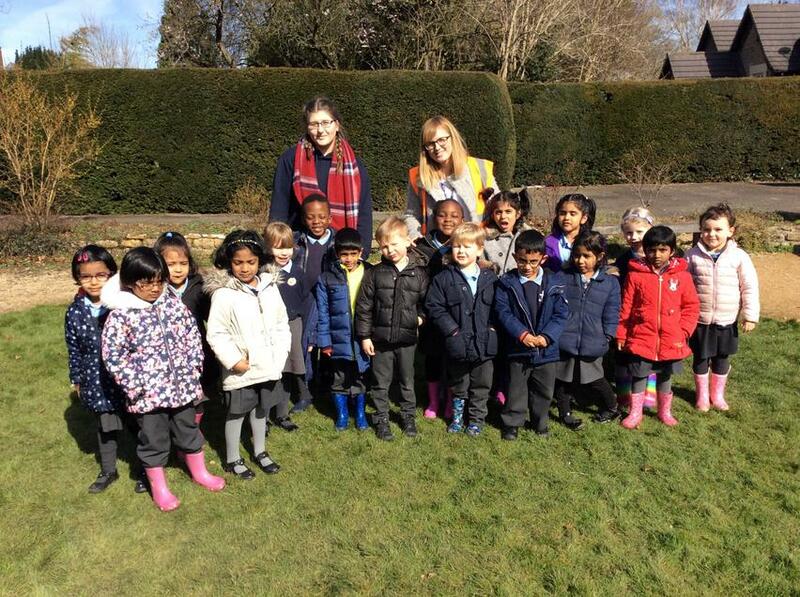 We hope you enjoyed it as much as the children did. 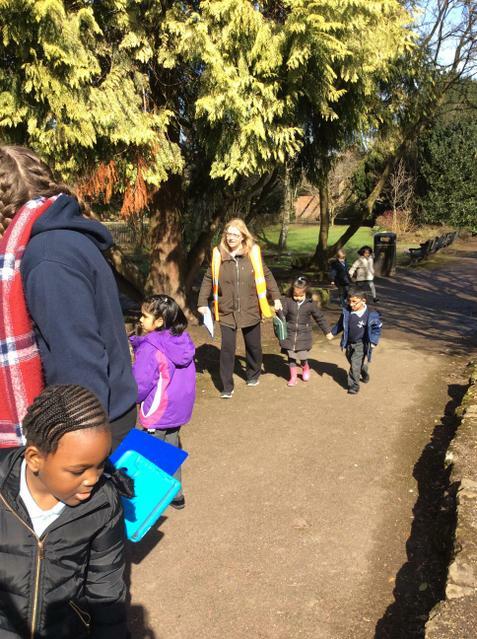 Spring Walk We went on a sunny Spring walk to Queens Park to look for signs of Spring. 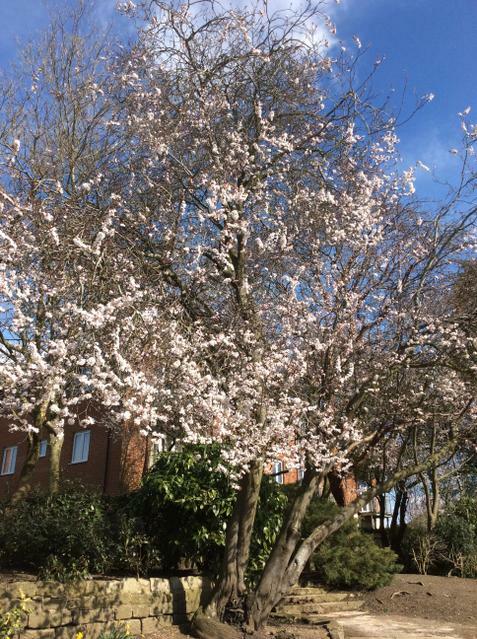 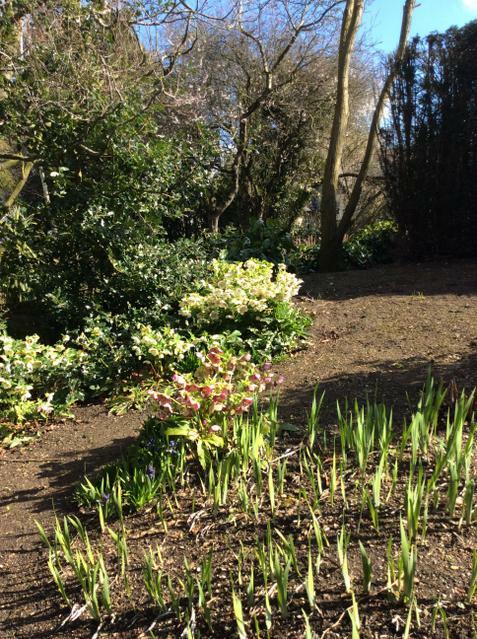 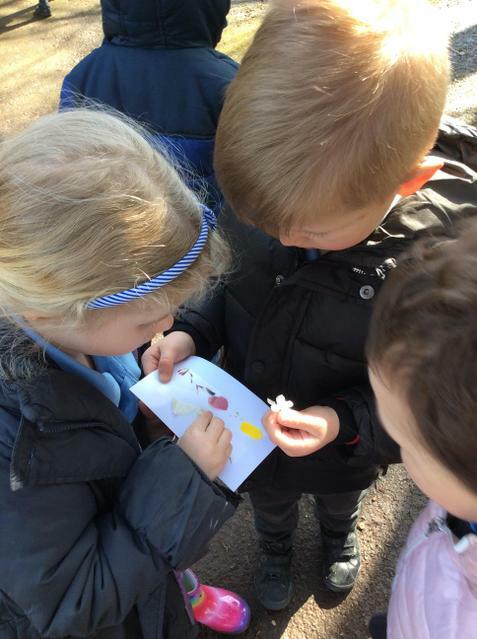 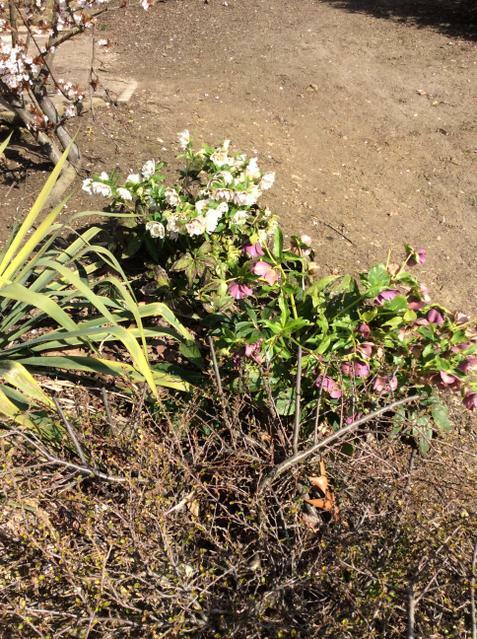 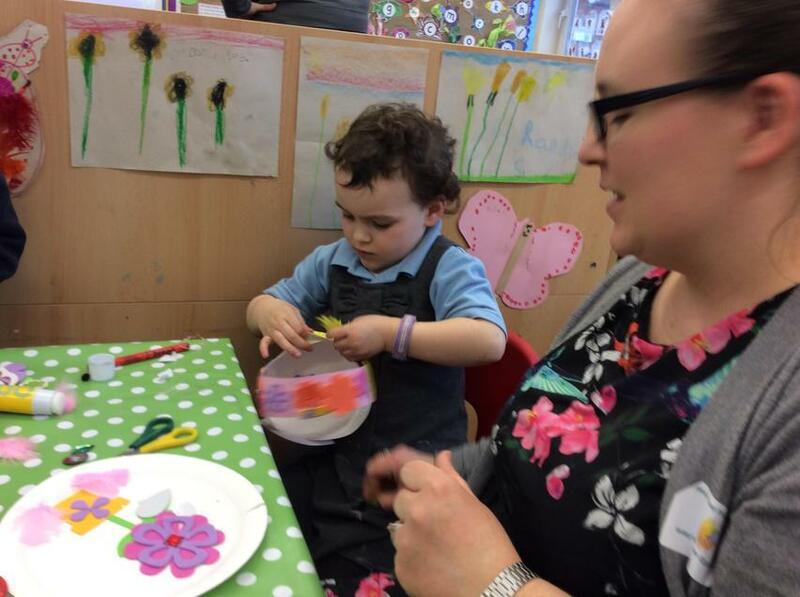 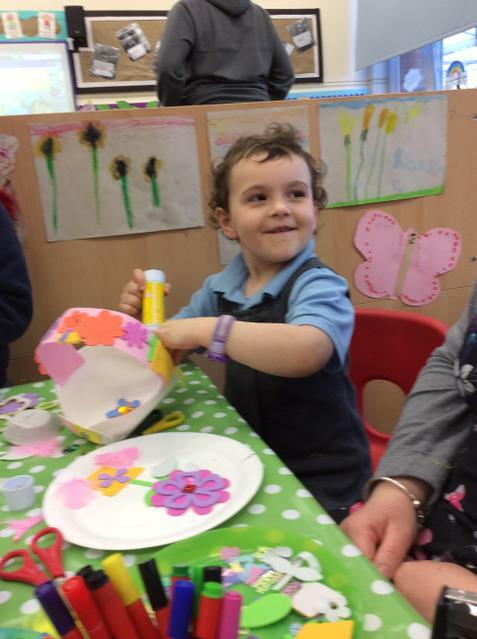 While we were there, we went on a colour hunt and made beautiful Spring collages. 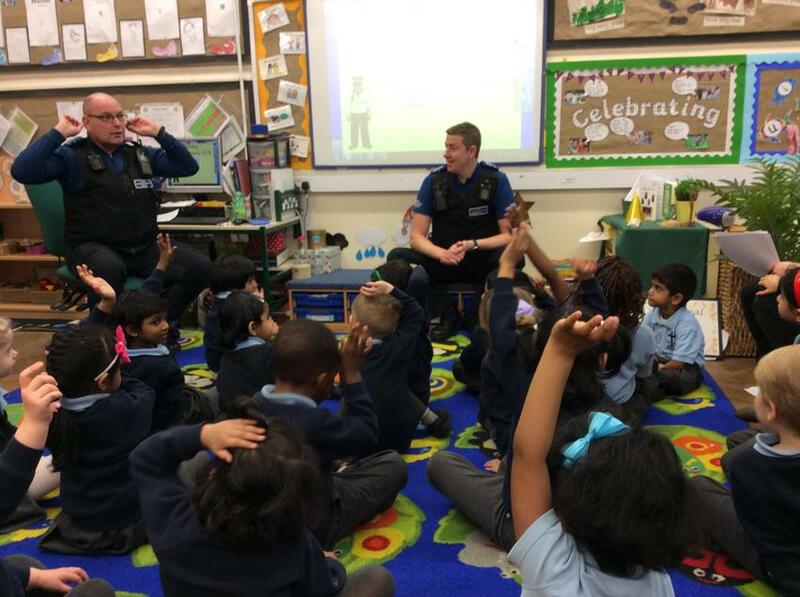 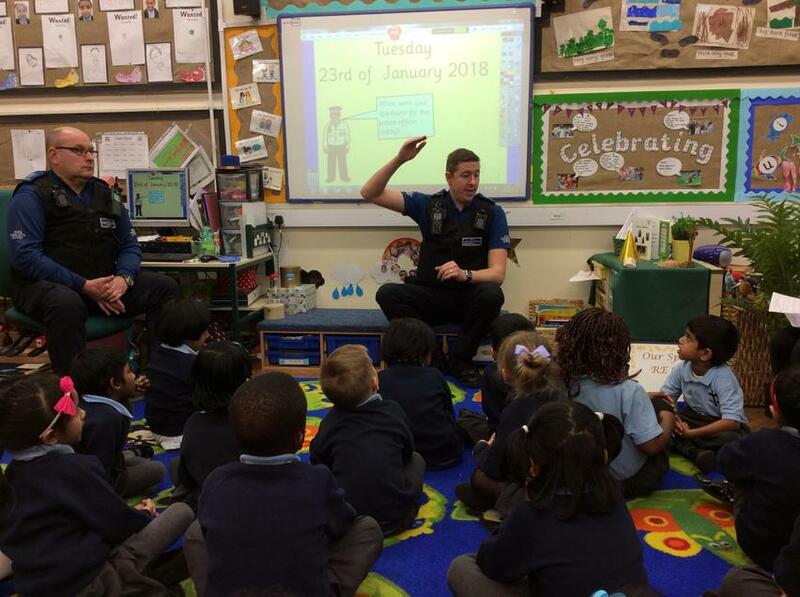 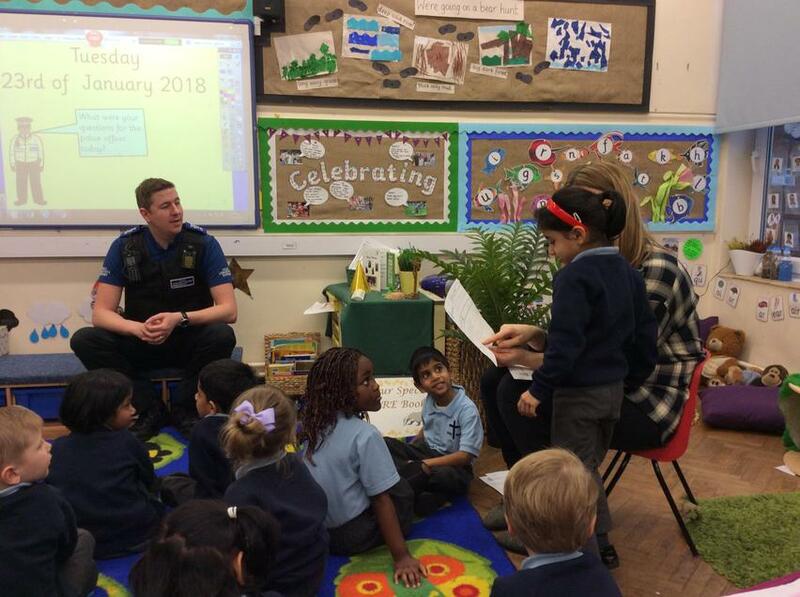 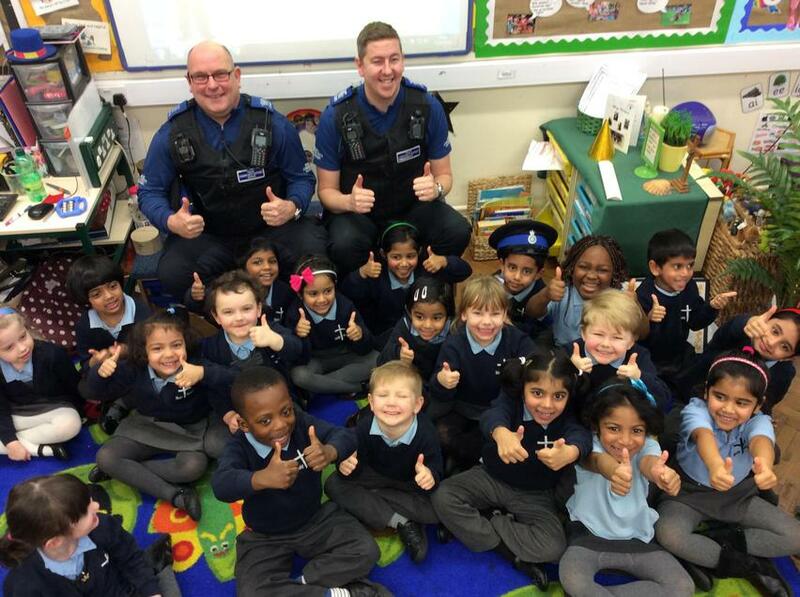 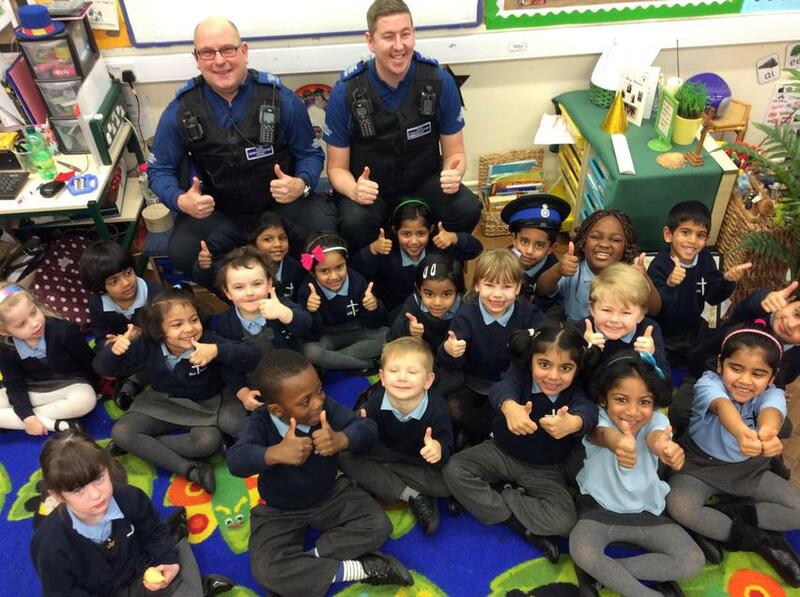 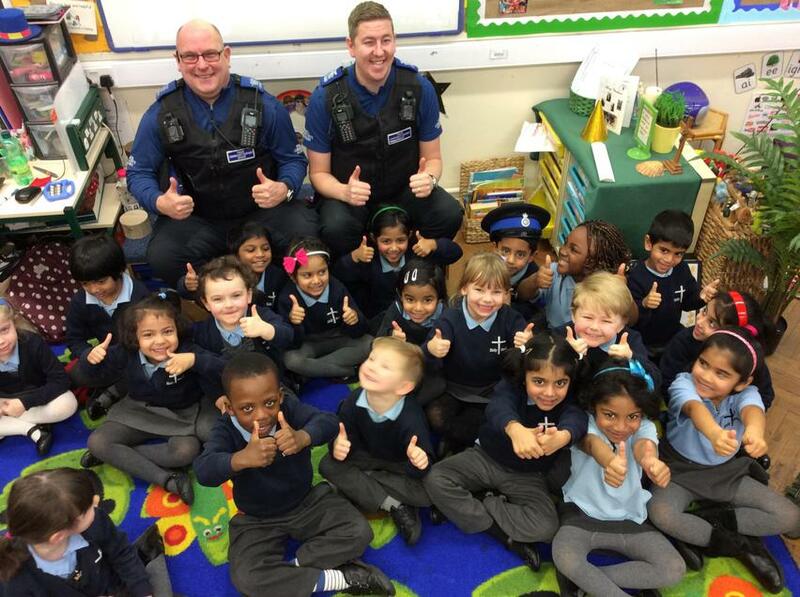 Our reception children had a visit from the police. 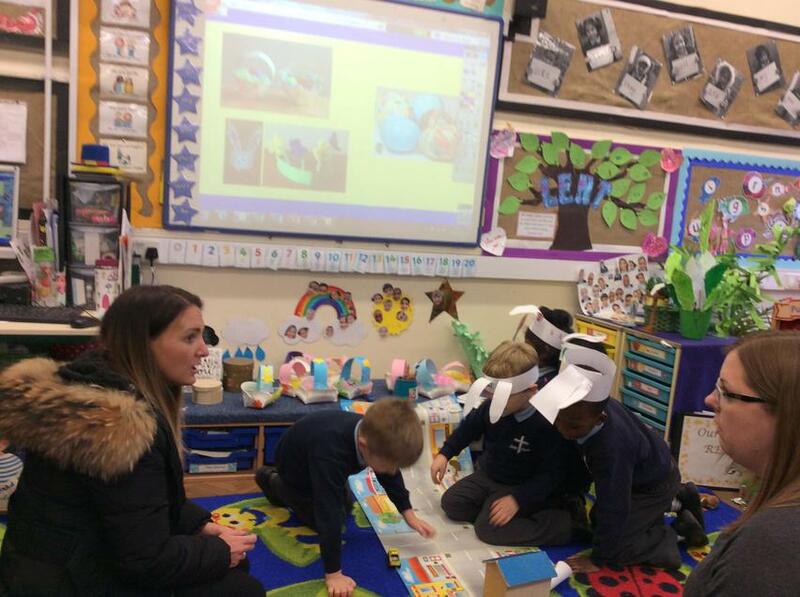 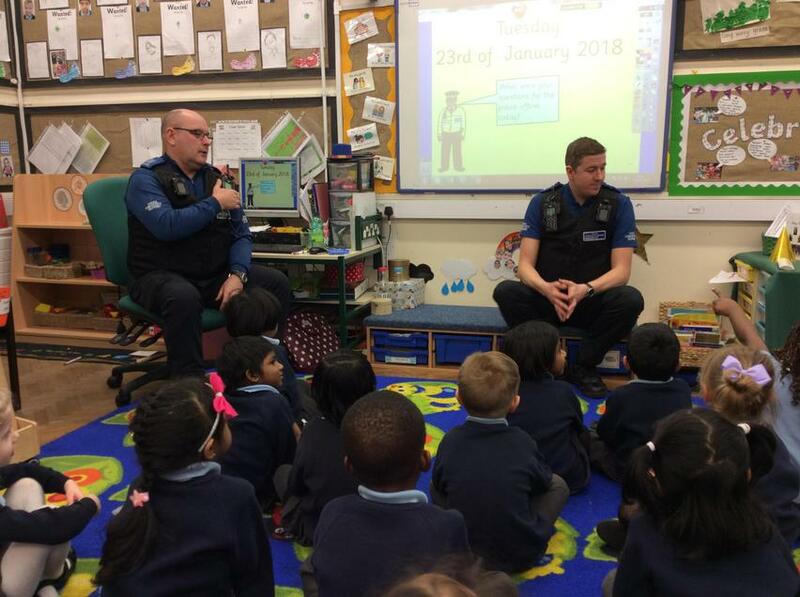 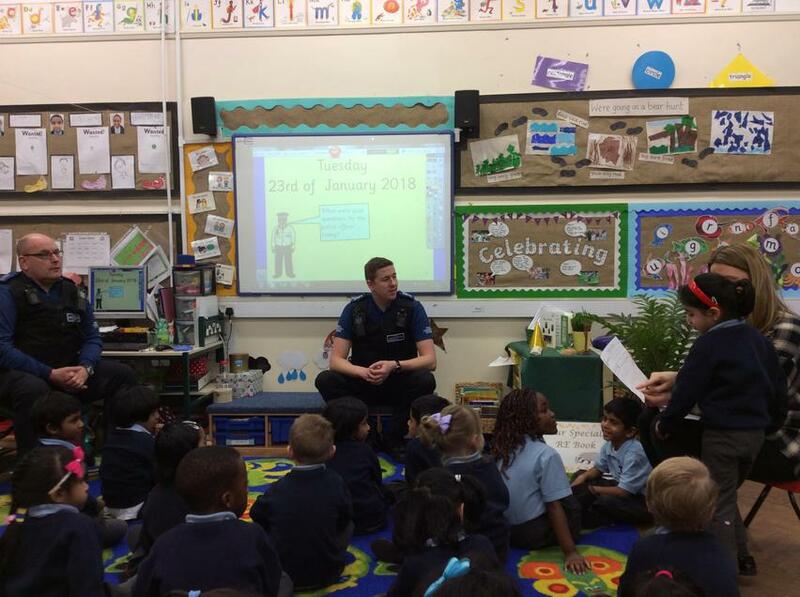 They talked to the children about their jobs and the children asked them some questions. 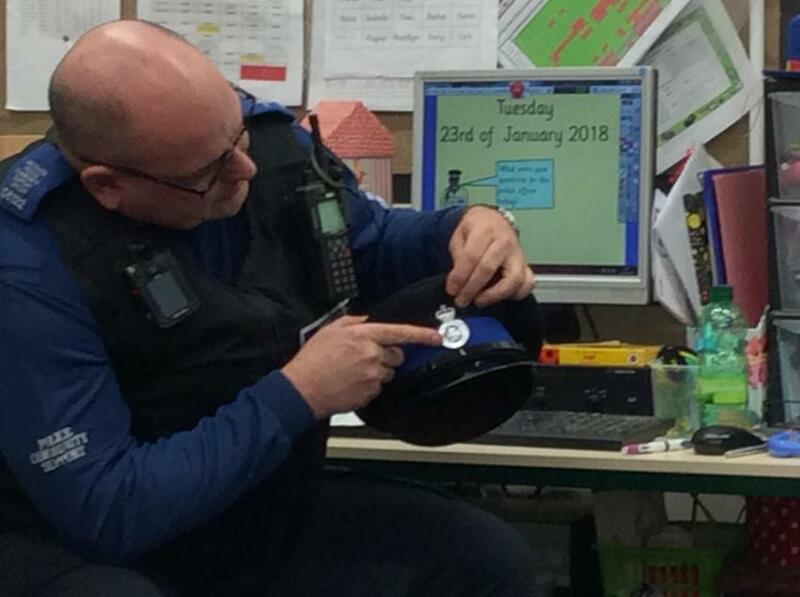 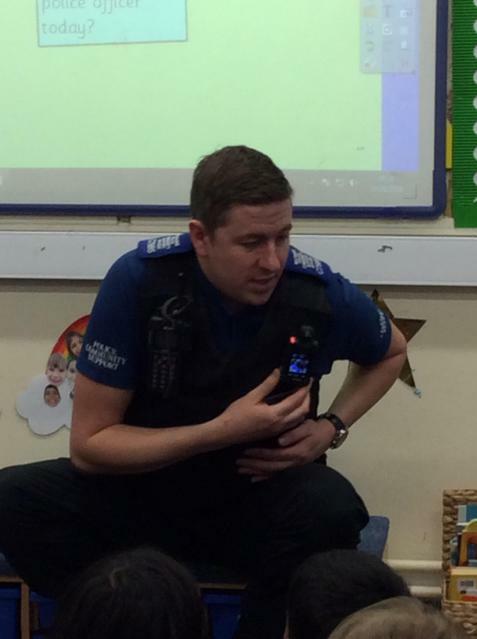 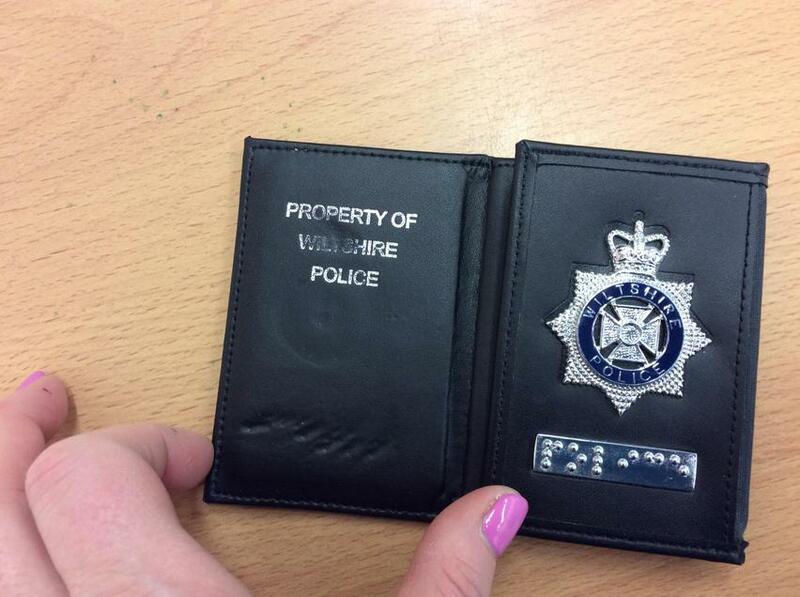 The class had the opportunity to ask questions and look at some of the things they use to help them do their job such as their radio, notebook and police ID badge. 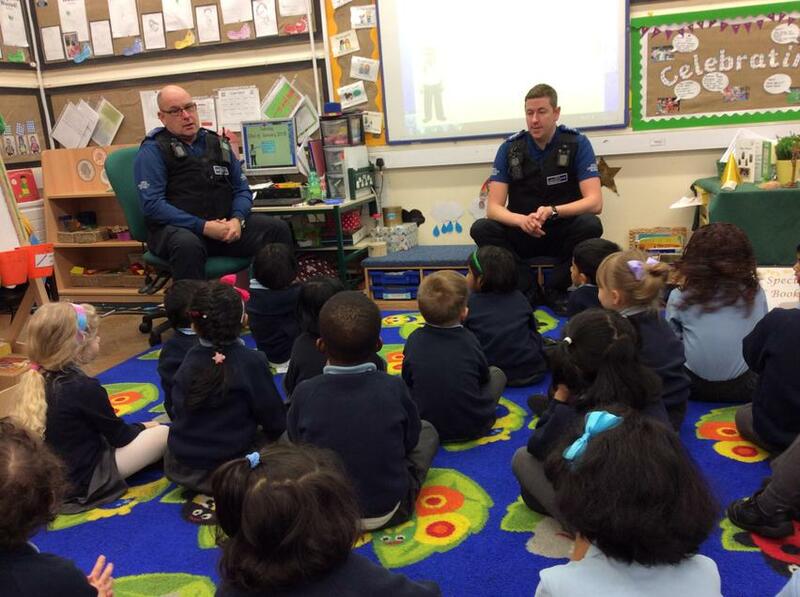 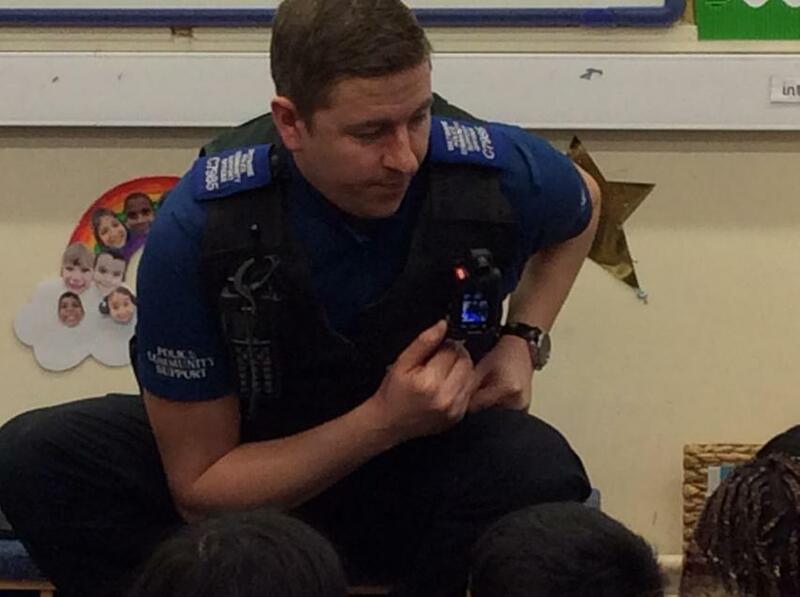 It was a great visit and the police were very impressed with the children's behaviour. 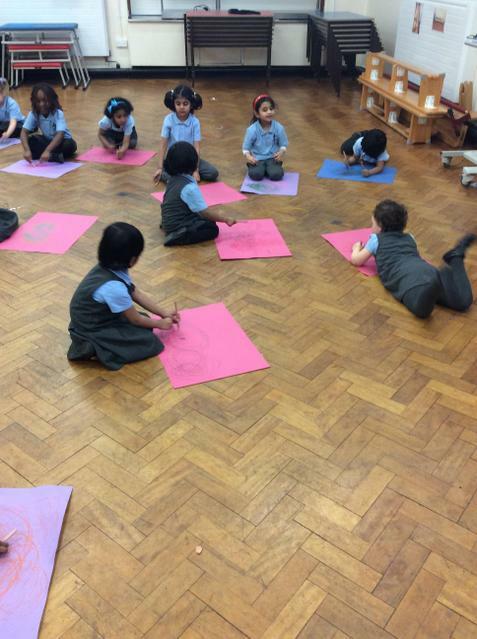 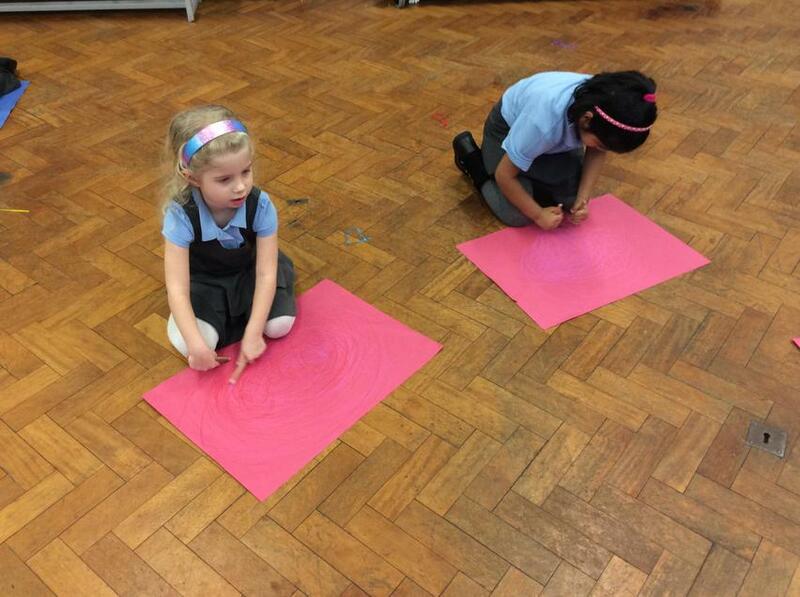 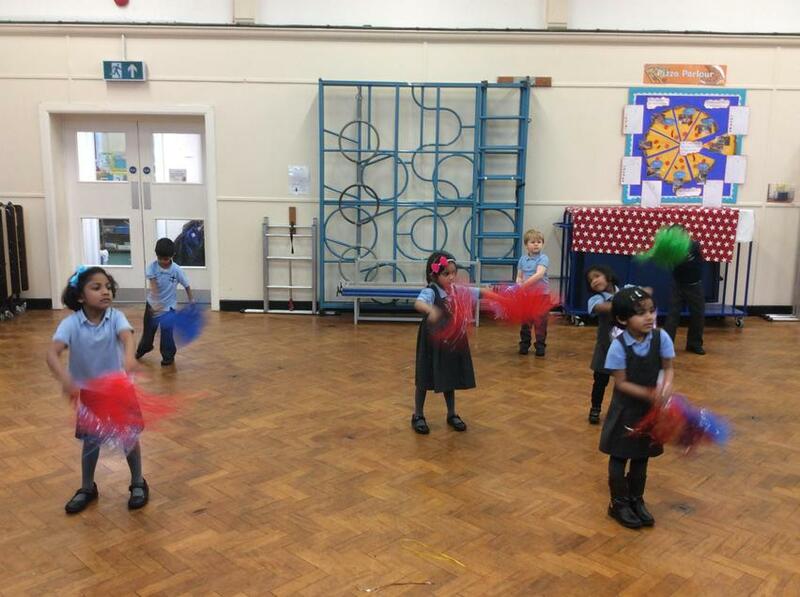 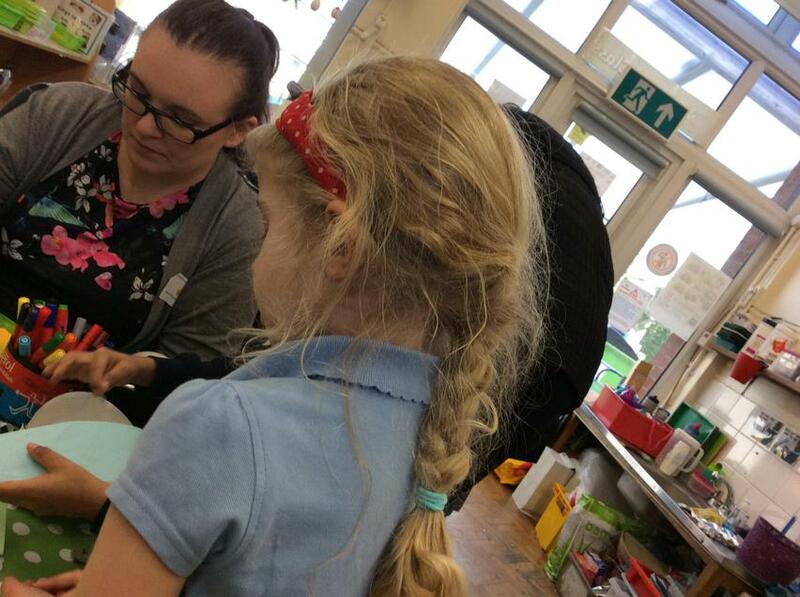 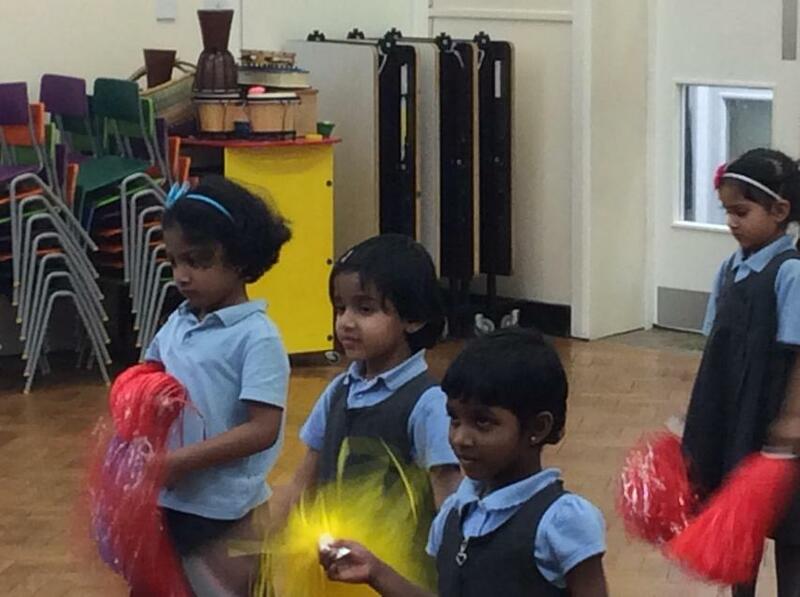 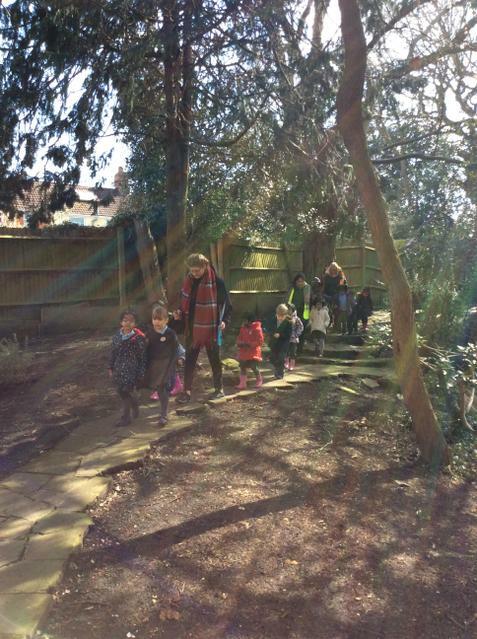 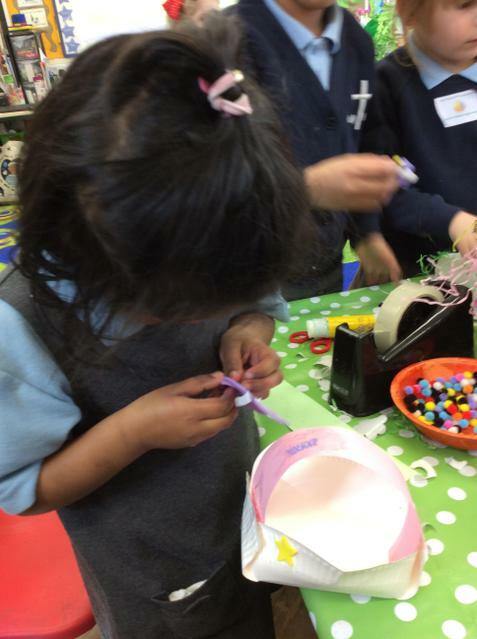 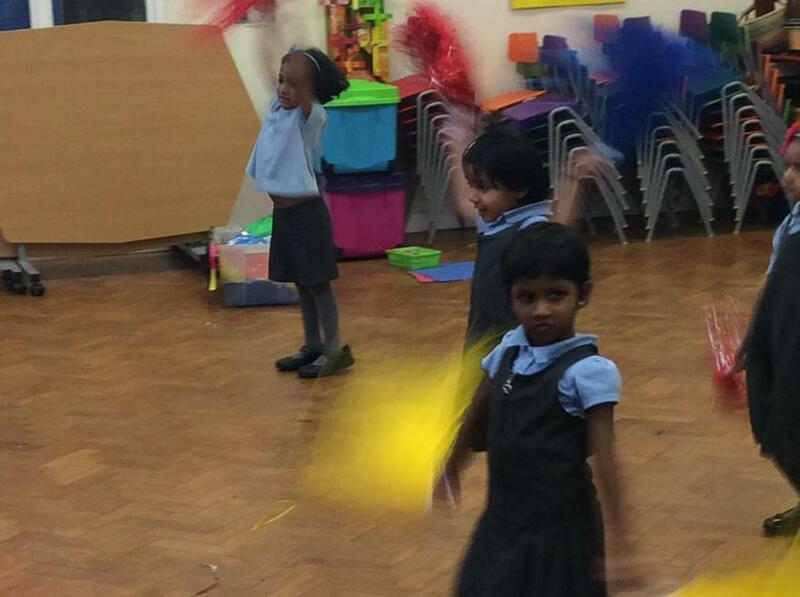 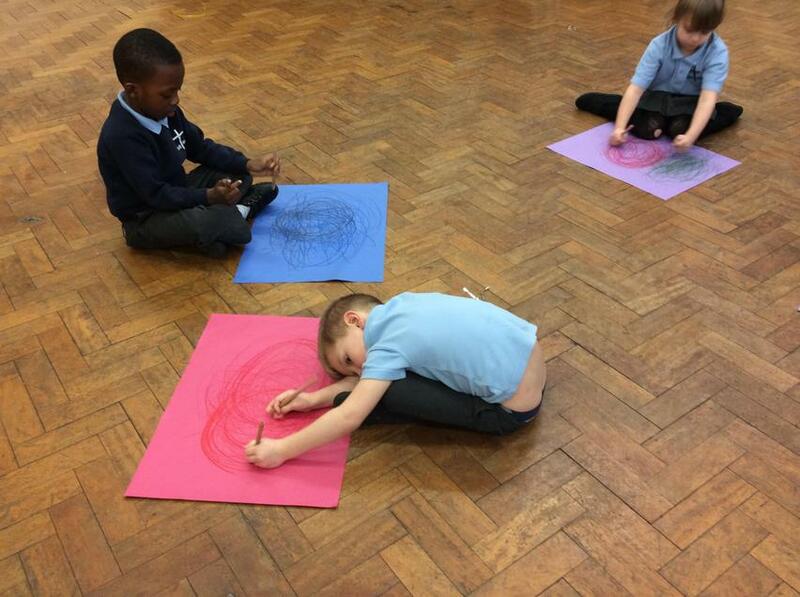 In reception the children take part in squiggle whilst you wiggle sessions. 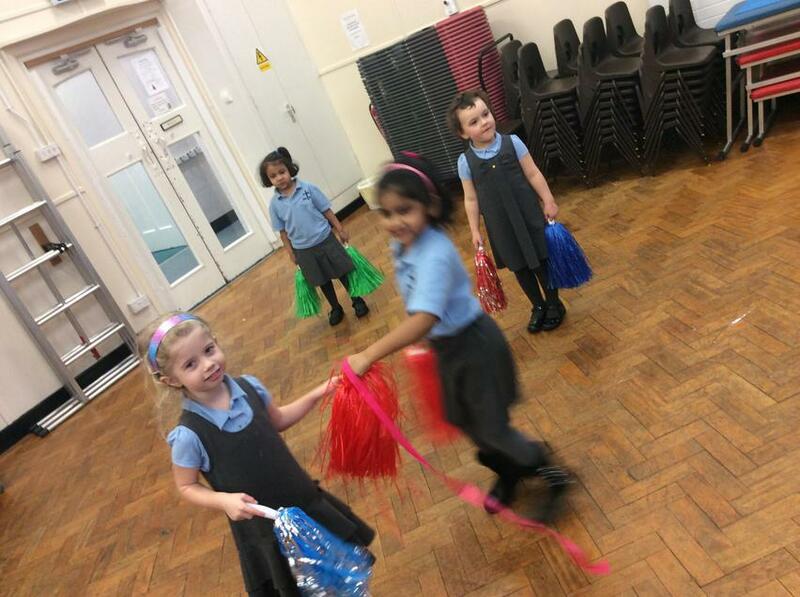 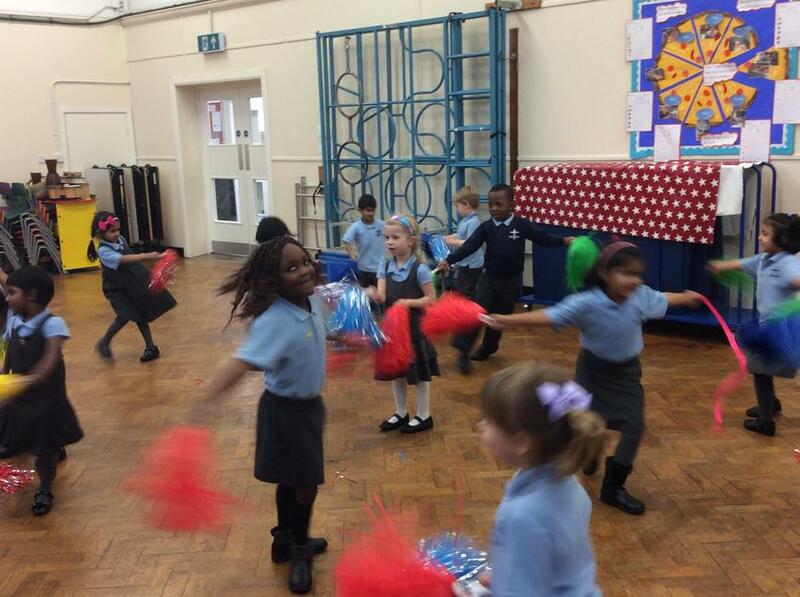 Each week they will learn a new gross motor movement to a piece of music. 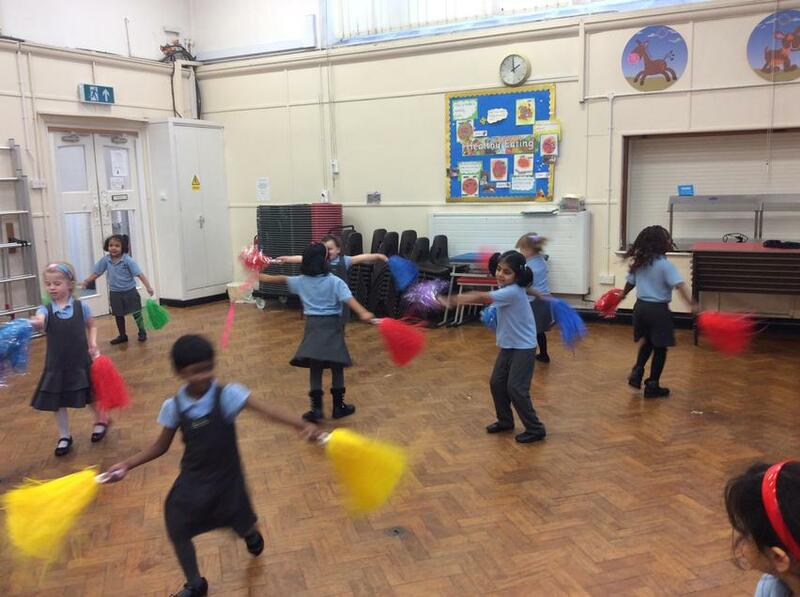 They will dance using this movement and use it to make marks. 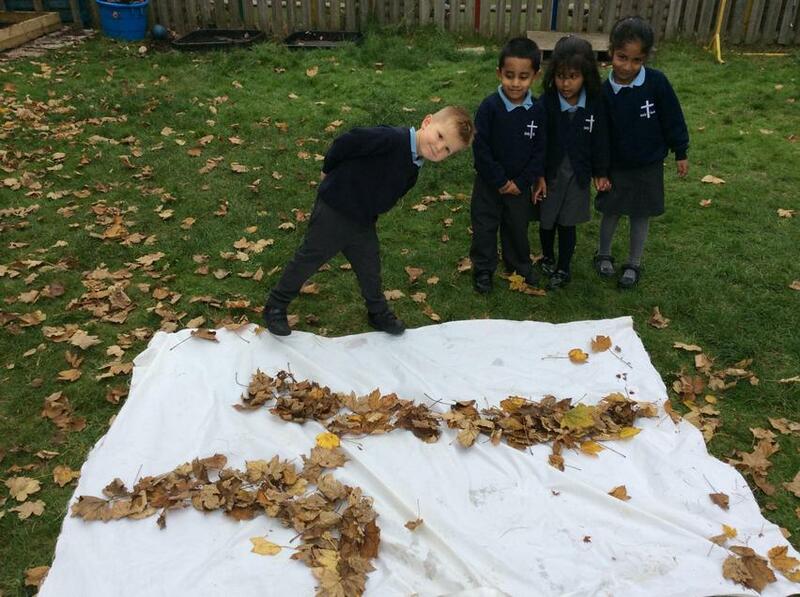 They will then use this action to think of letters they can form that use this shape. 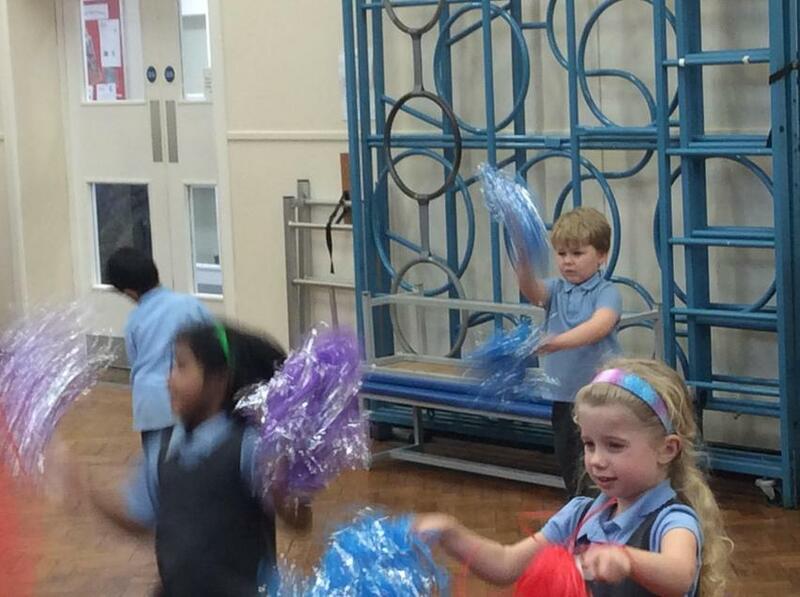 These sessions are great fun but most importantly help your child to be confident mark makers. 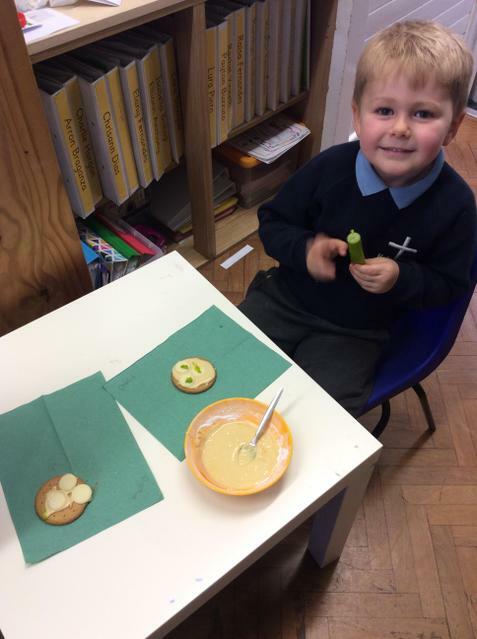 We have had a visit from the Evil Pea! 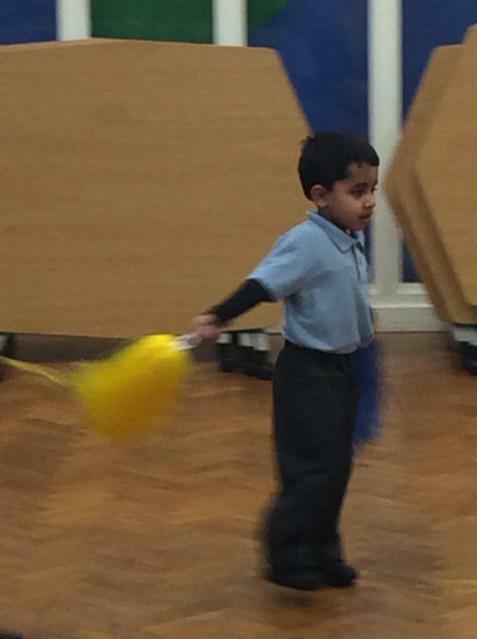 He has been up to no good and has been causing all sorts of trouble in our classrooms! 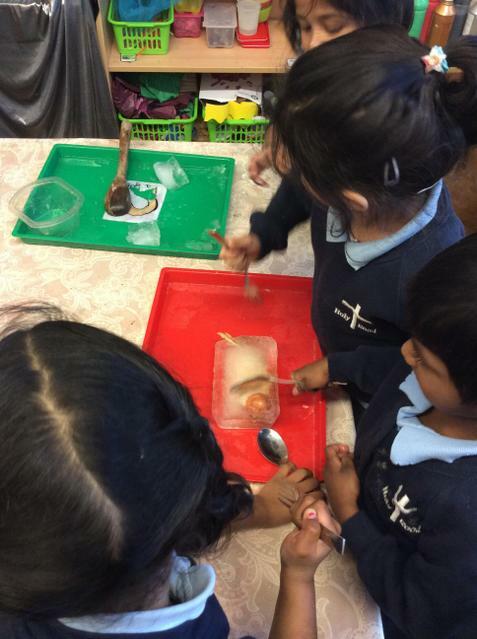 He kidnapped Supertato, made a mess in our classrooms and frozen vegetables in ice. 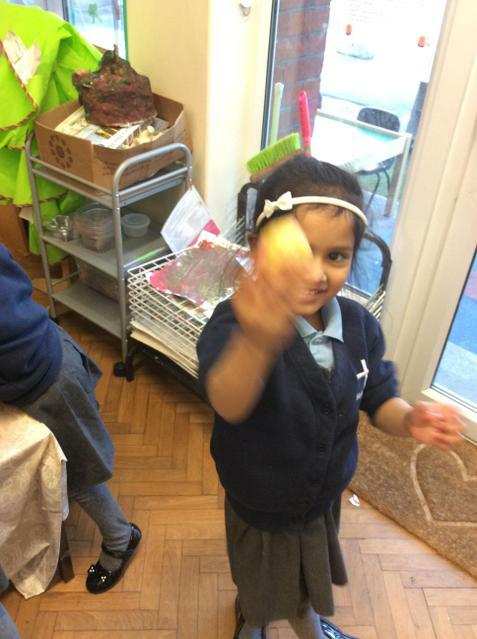 We have been working hard to help Supertato to put a stop to the Evil Pea. 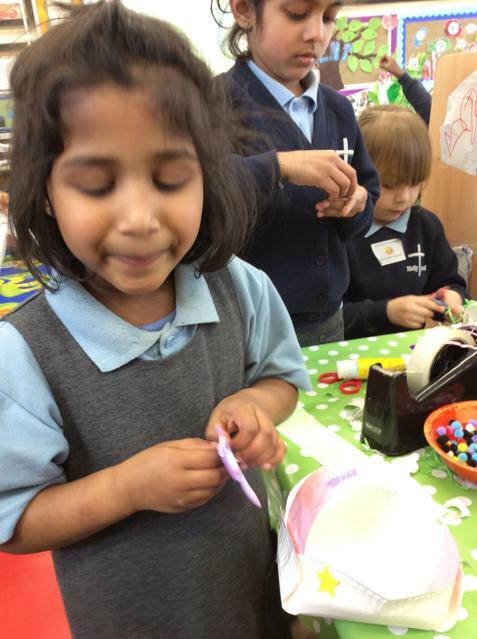 The children have been designing and making traps, making their own super-veggies and writing messages to the evil pea. 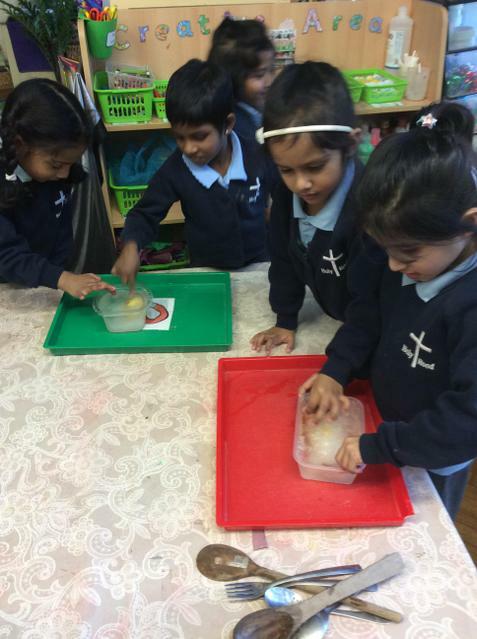 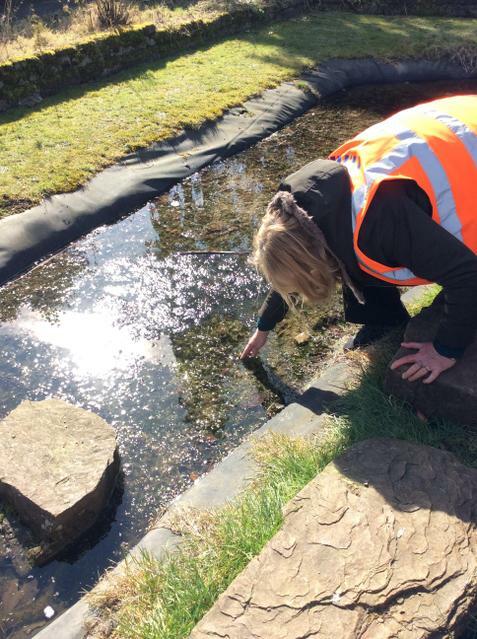 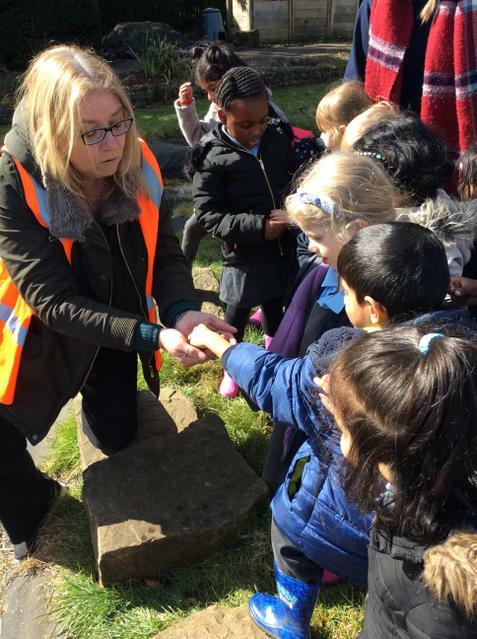 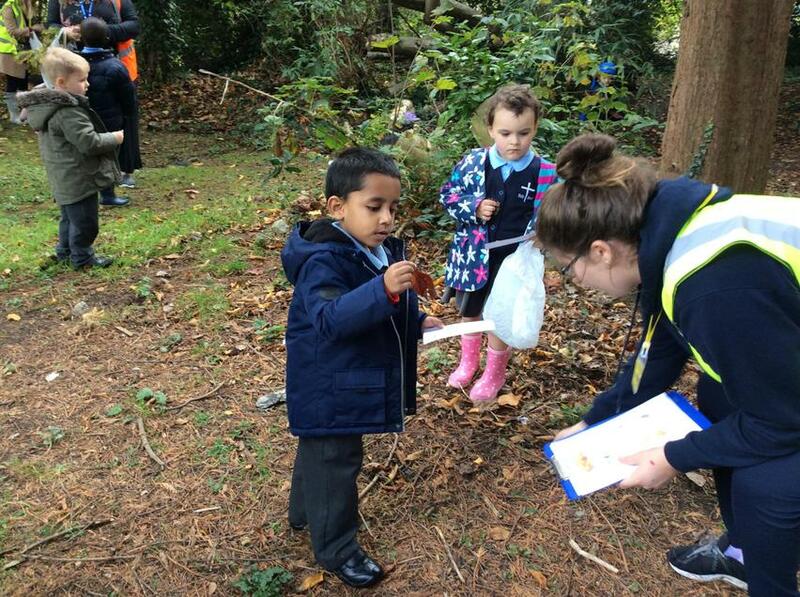 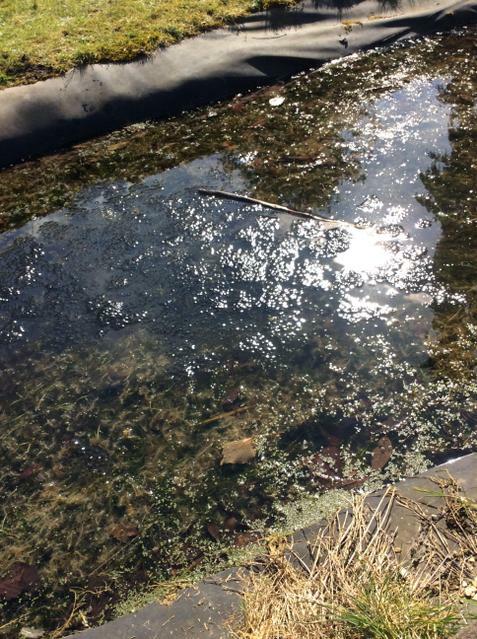 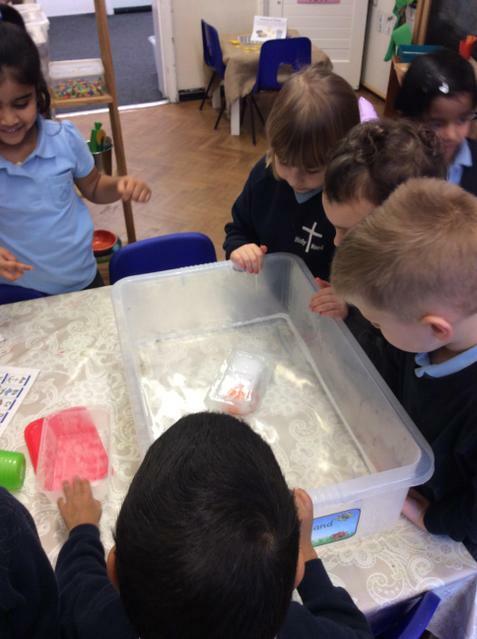 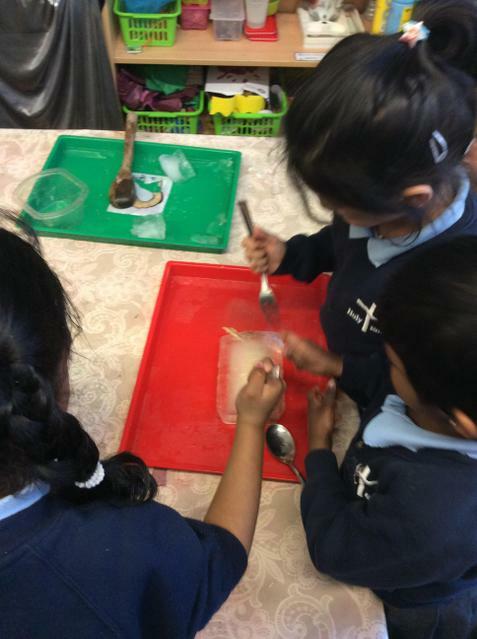 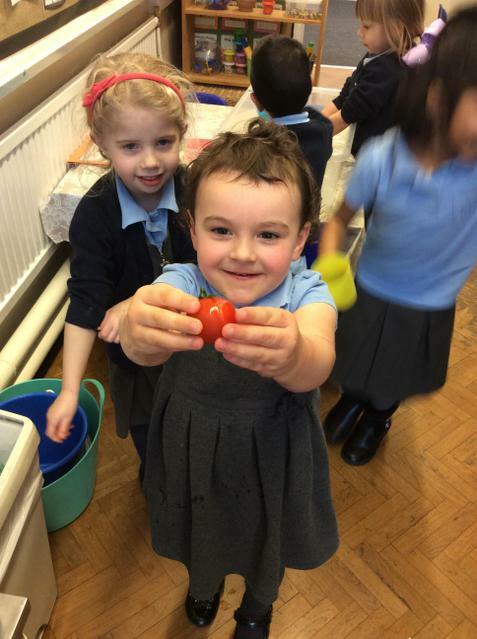 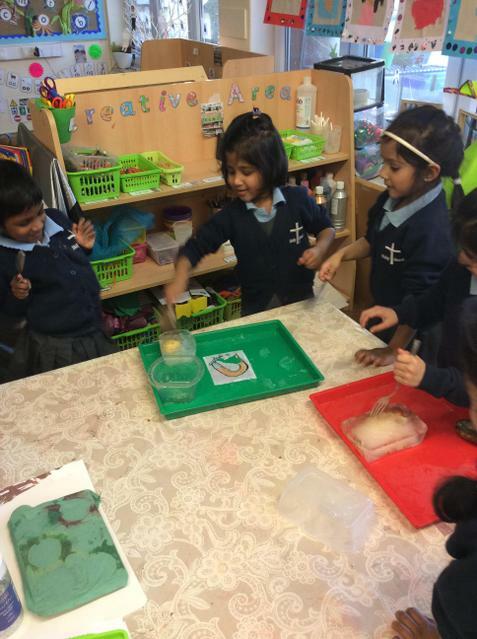 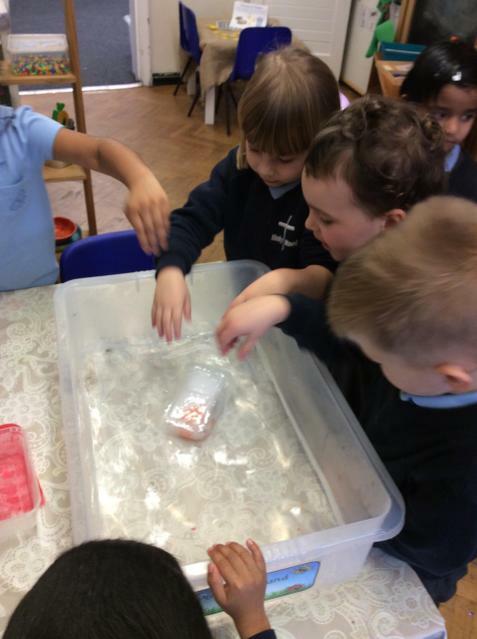 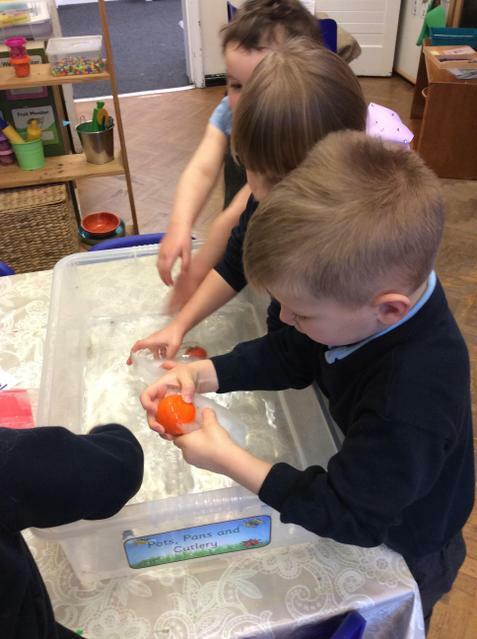 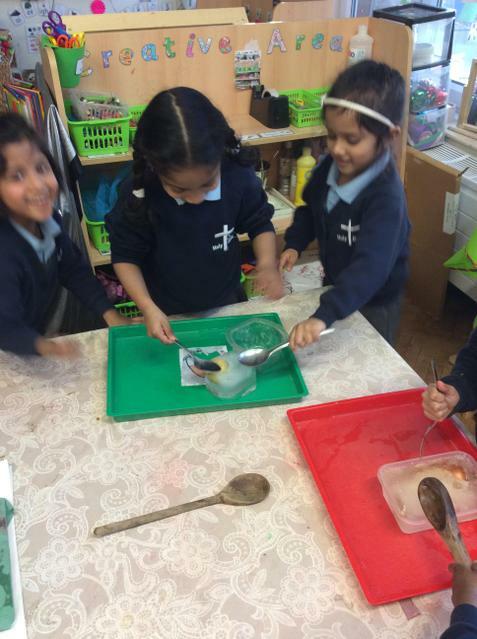 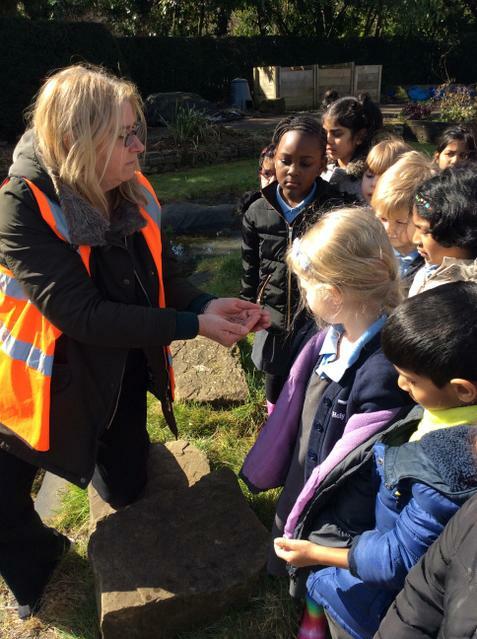 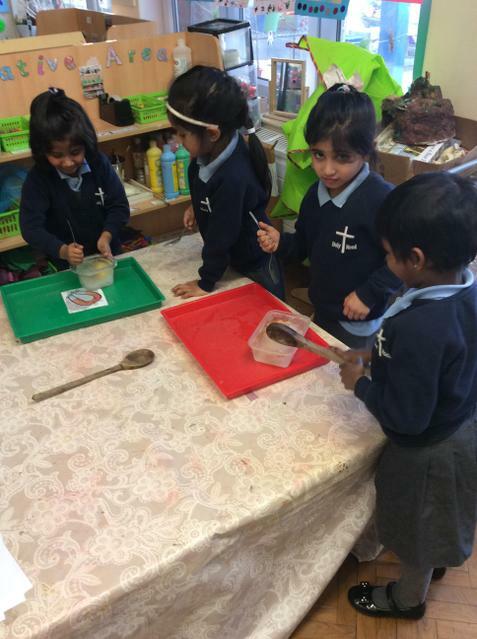 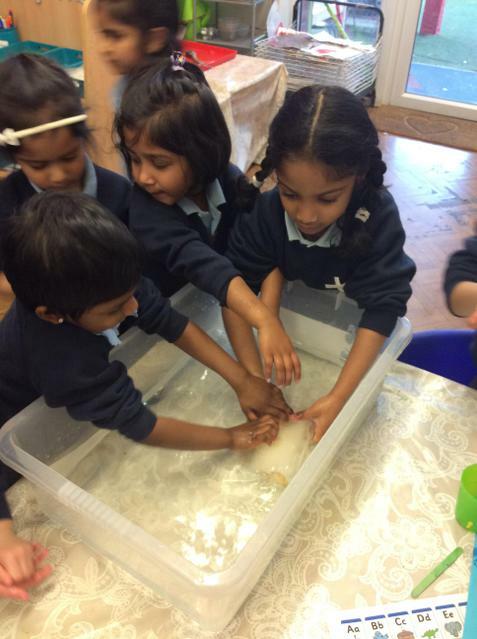 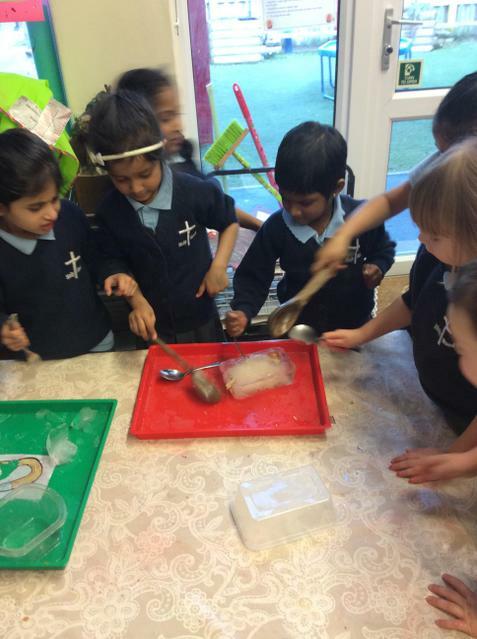 Below are some photos of the children exploring different ways of rescuing the vegetables frozen in ice. 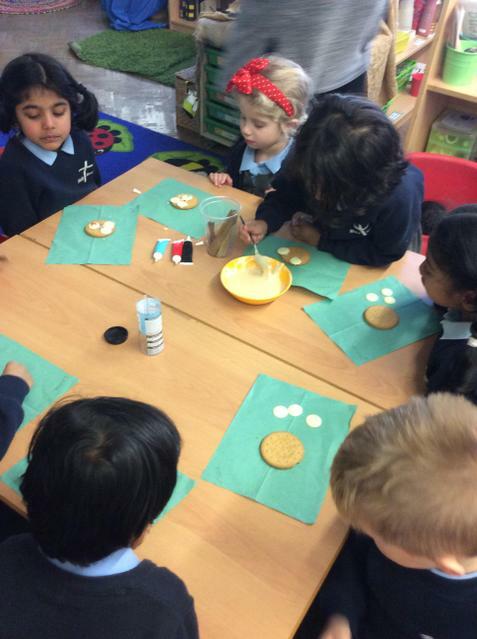 Each week the children take part in a diamond challenge in order to win a treat for the class which is chosen by them. 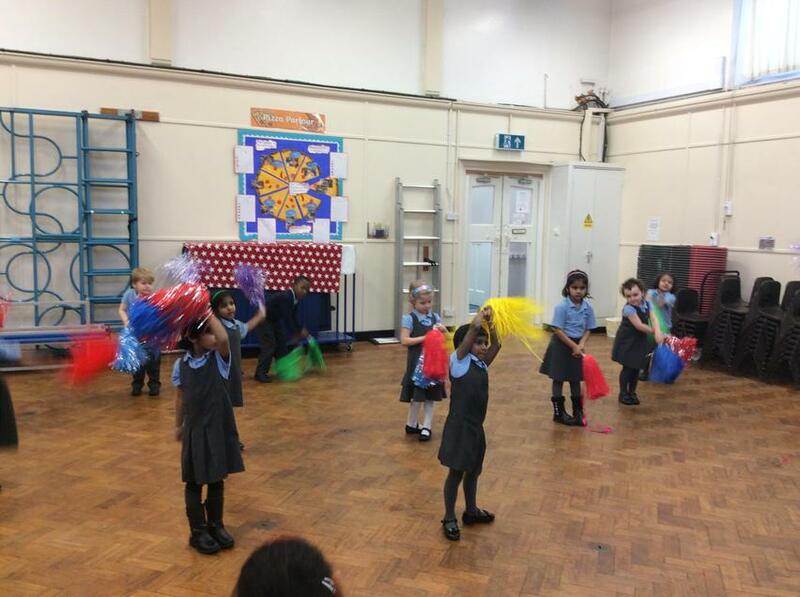 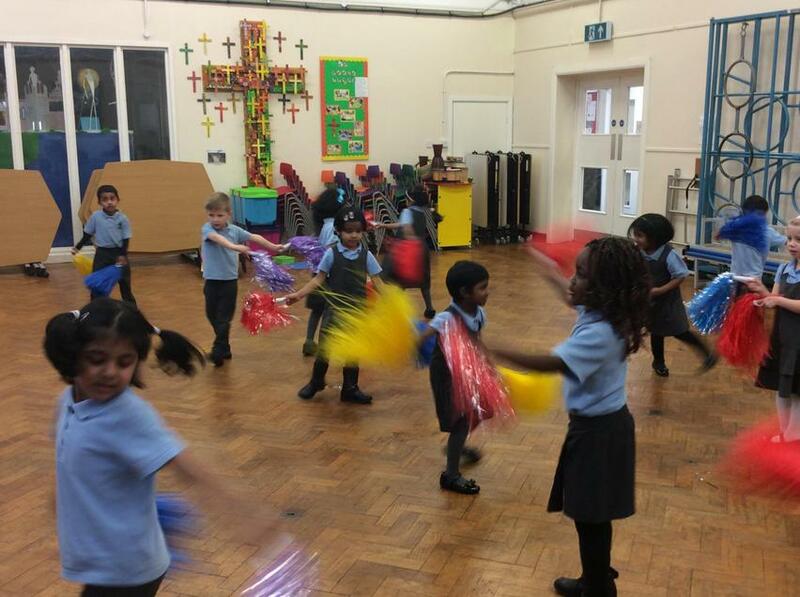 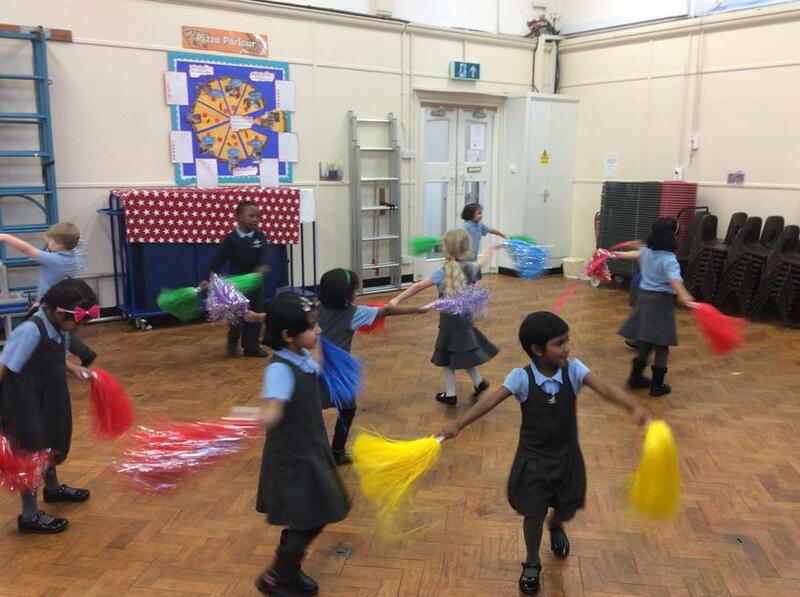 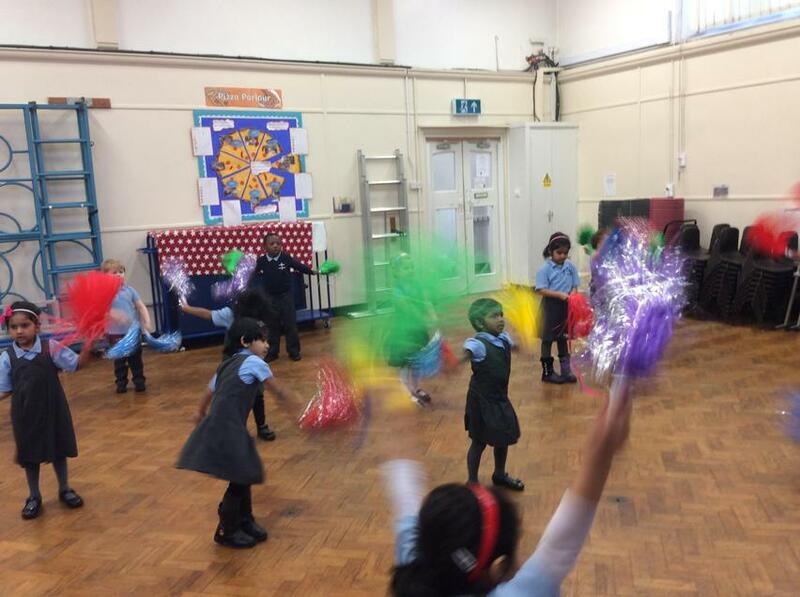 Treats have included parachute games, a disco, ball games, making healthy kebabs along with many others. 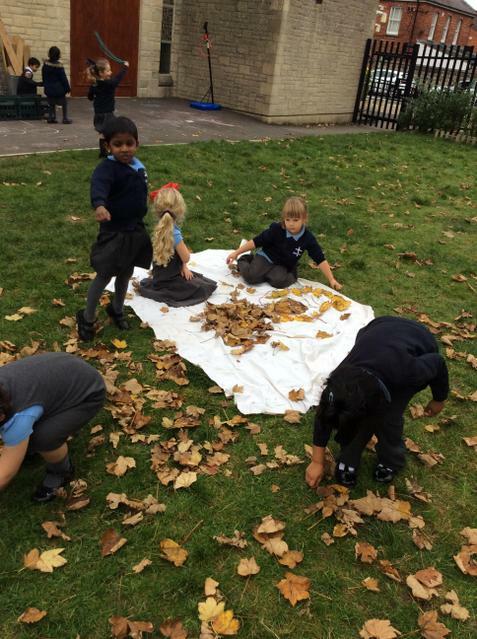 In order to win a treat, the children must complete a challenge throughout the week. 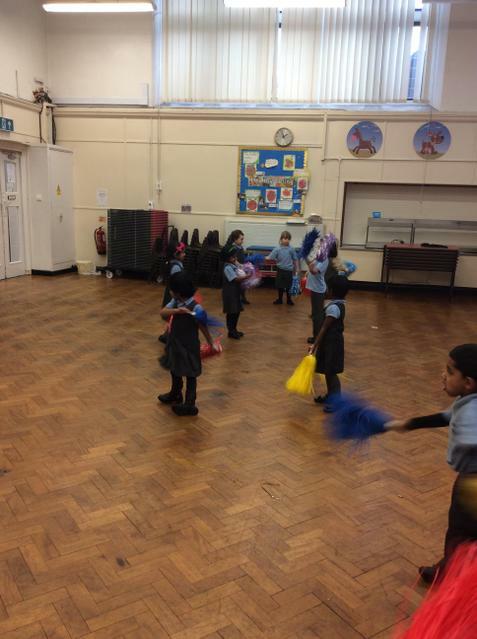 At the moment the children are trying hard to keep our classroom tidy. 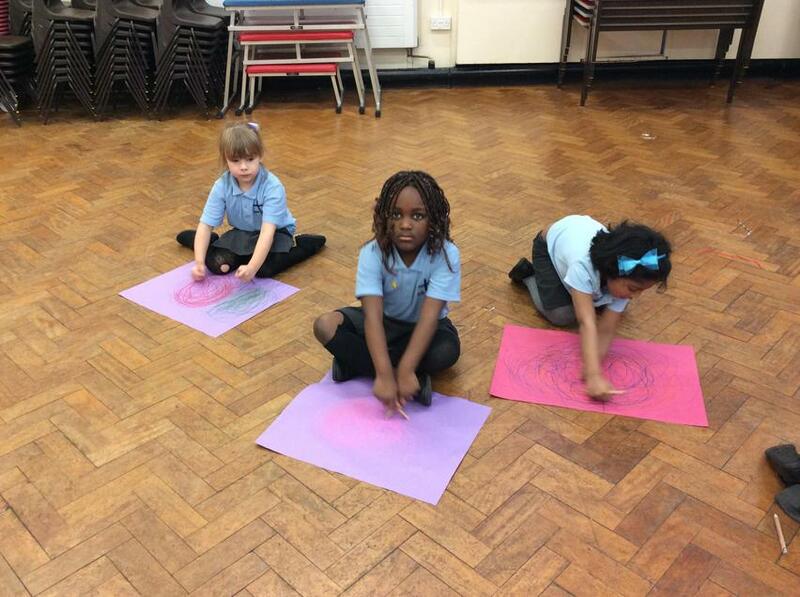 At tidy up time if they tidy the classroom by themselves with no adult help, they win a diamond. 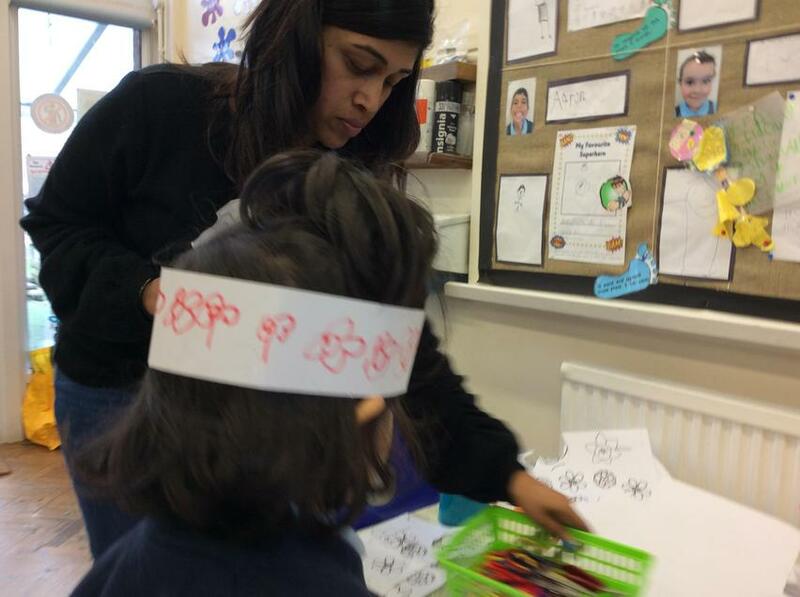 If the teachers need to step in and help the children then they adults get the diamond. 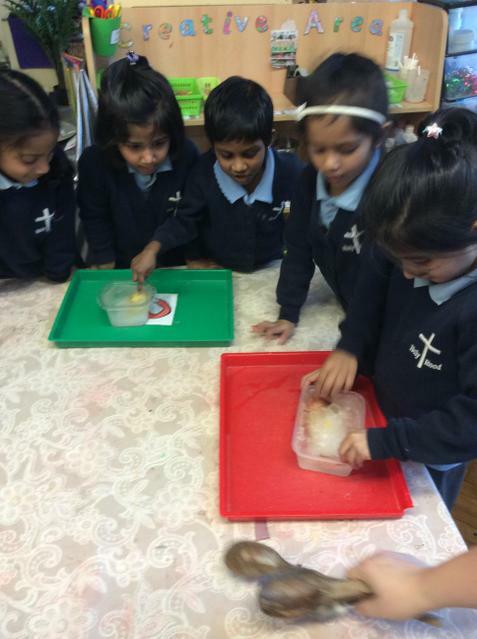 At the end of the week, the diamonds are counted to see if the children win their treat. 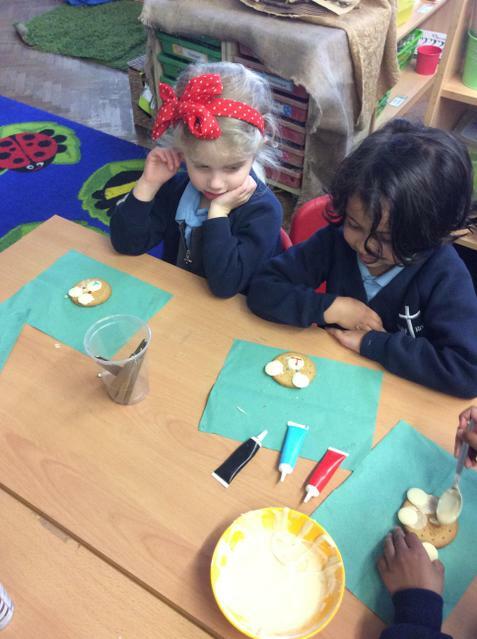 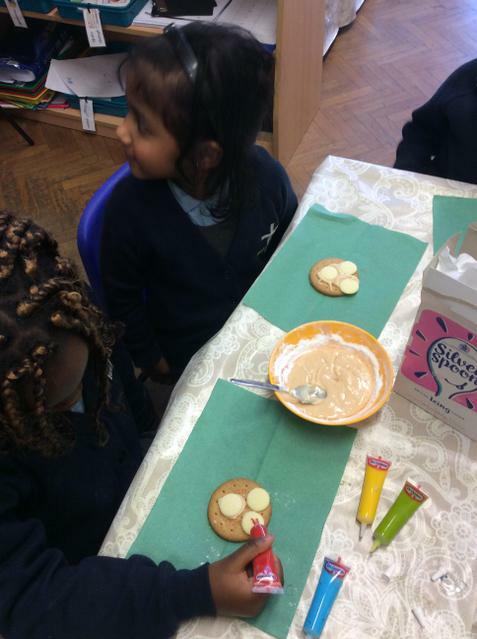 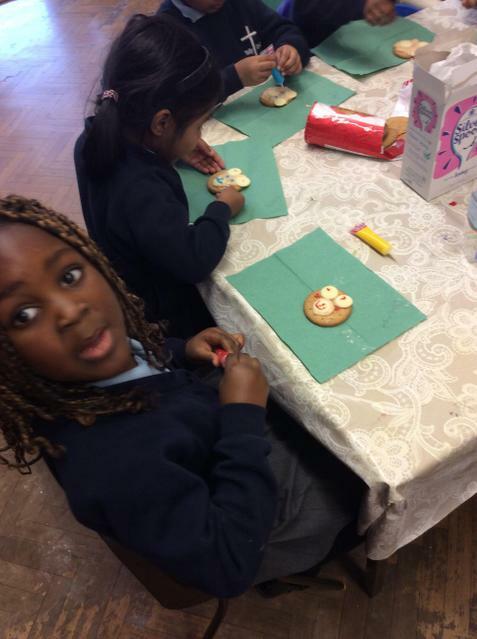 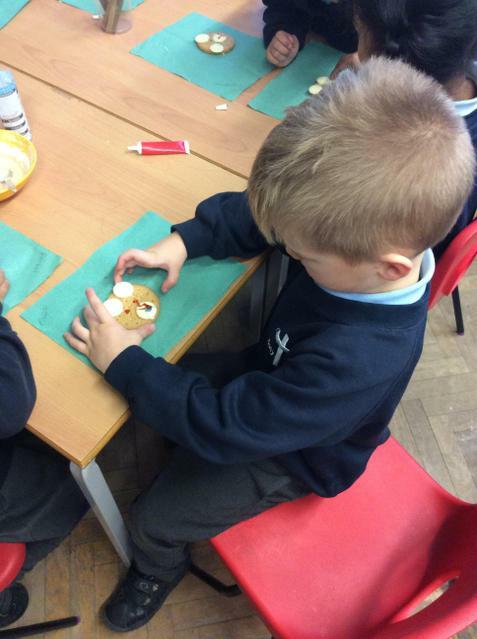 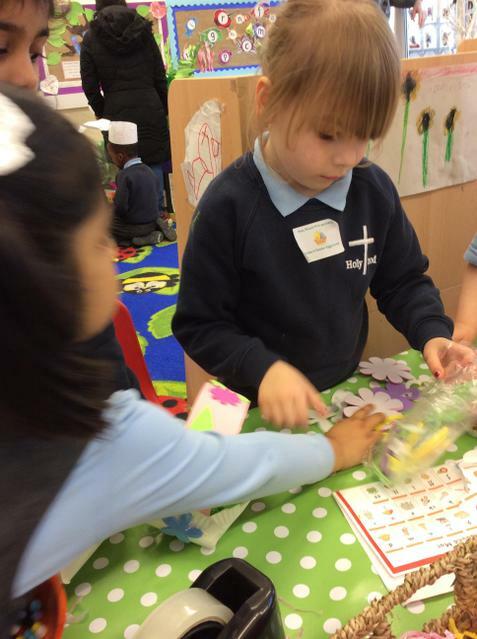 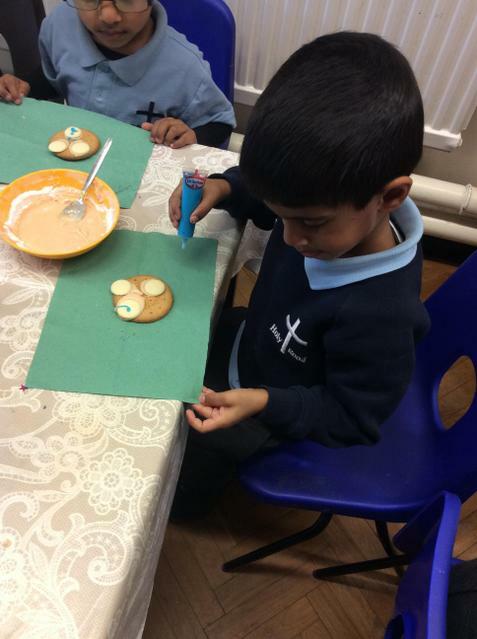 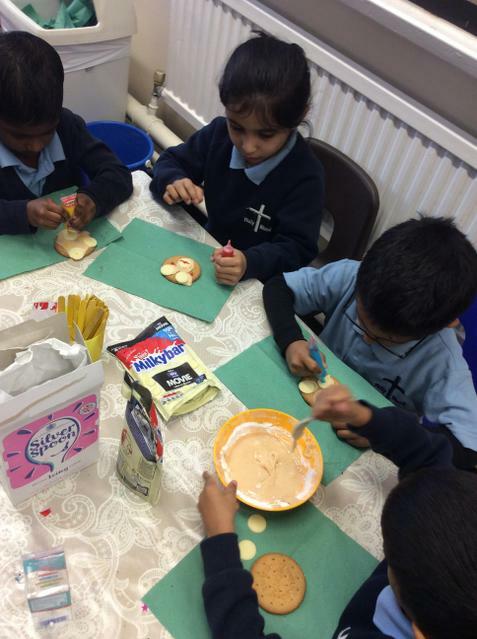 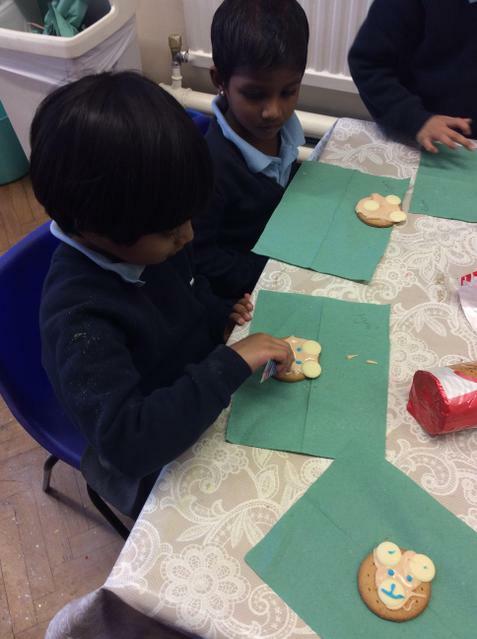 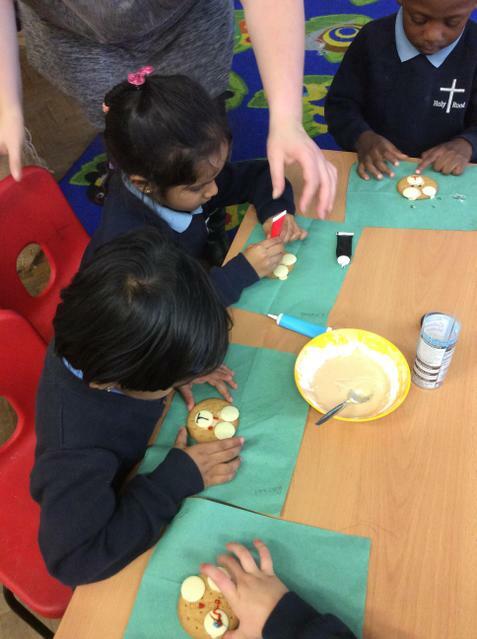 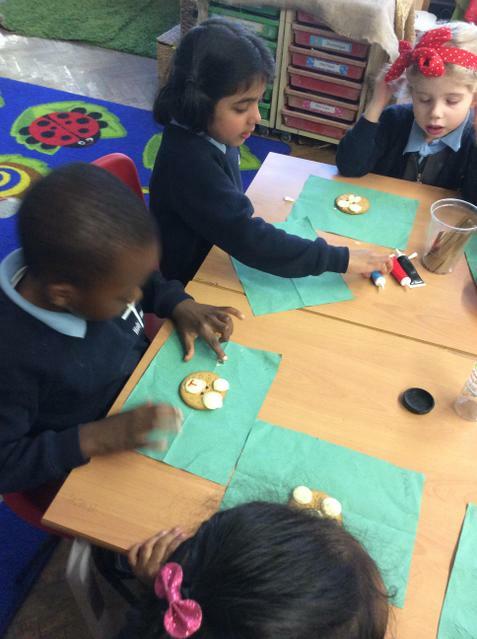 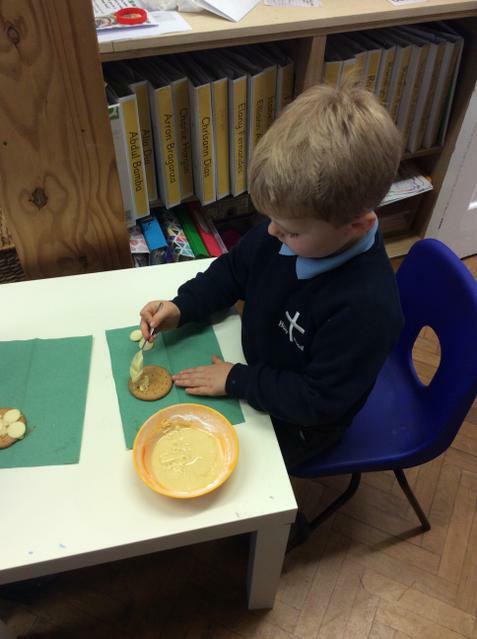 Below are some photos of the children enjoying one of their treats which was to decorate biscuits. 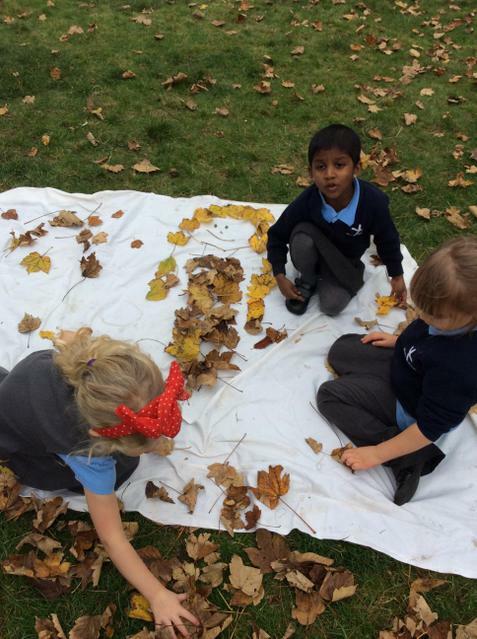 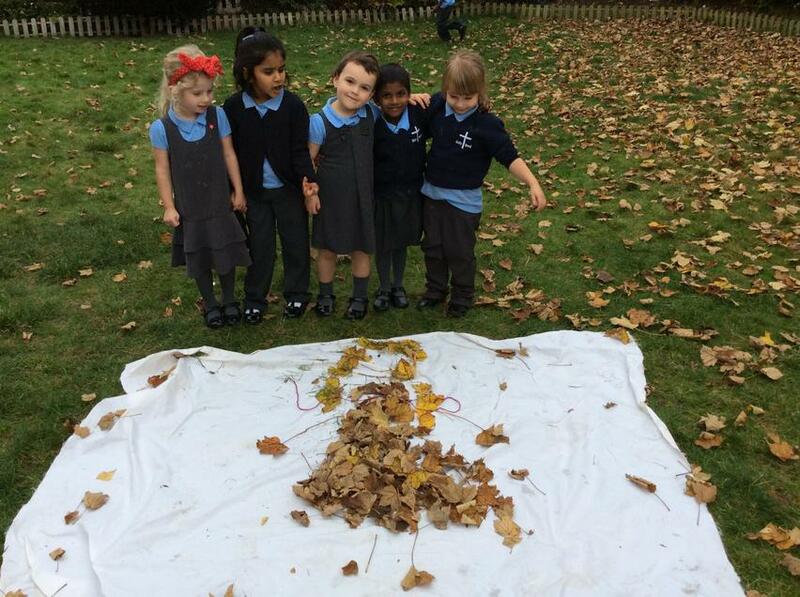 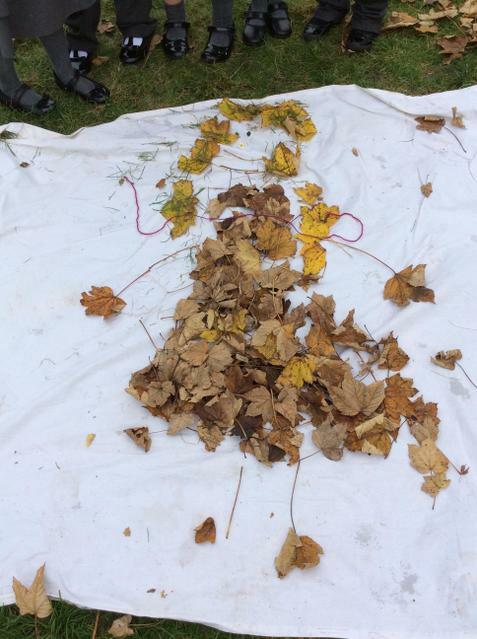 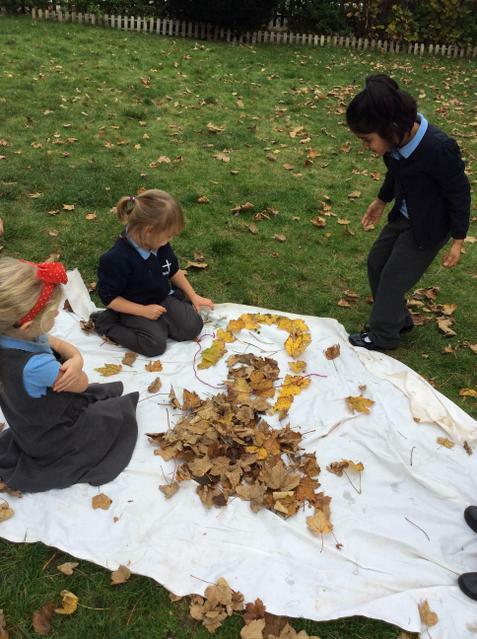 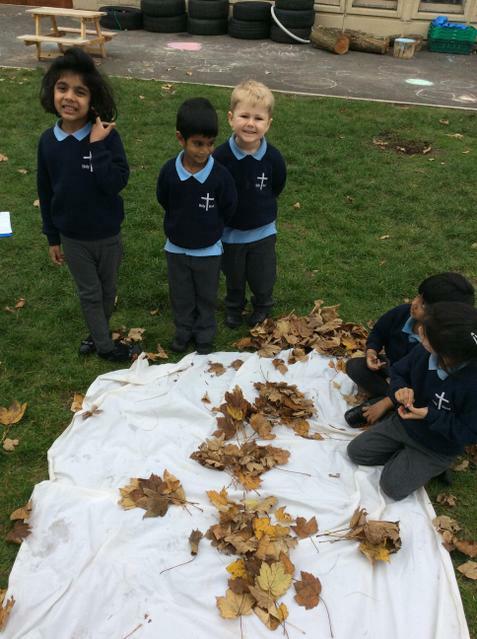 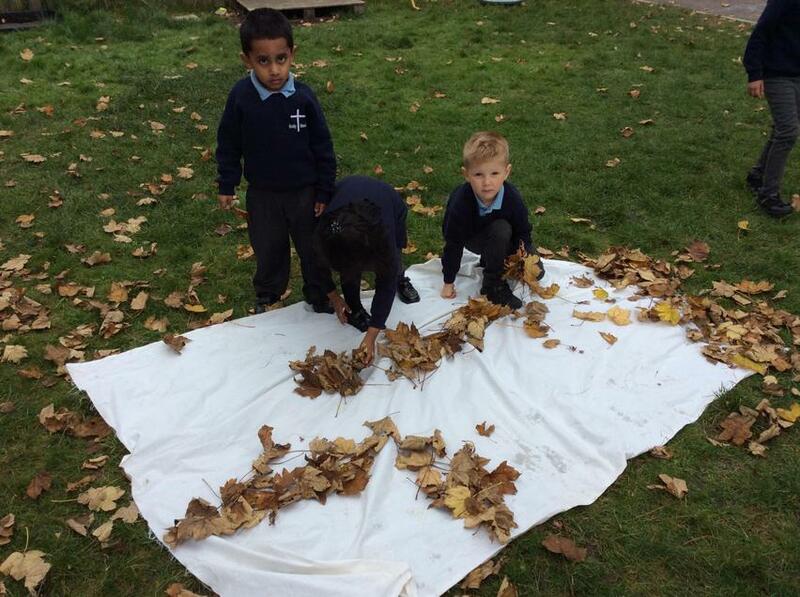 After reading the story, 'Leaf Man', we made out own leaf creatures. 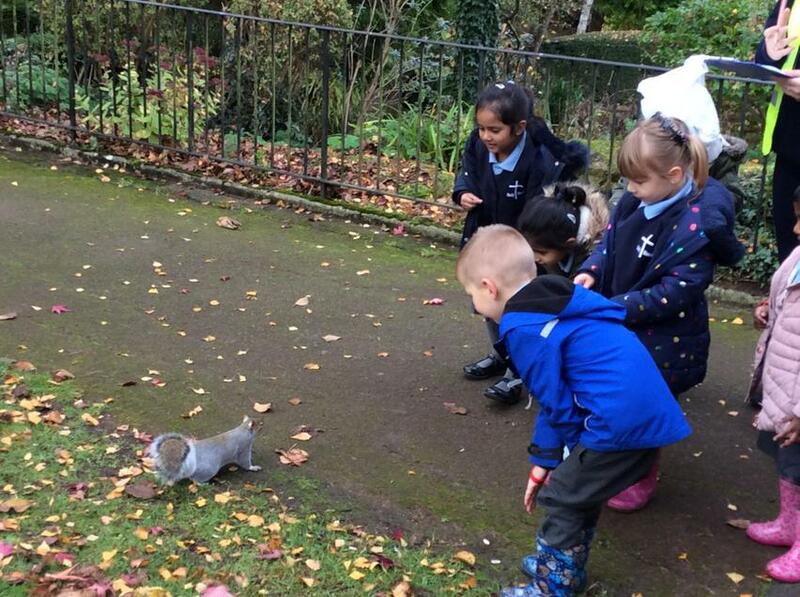 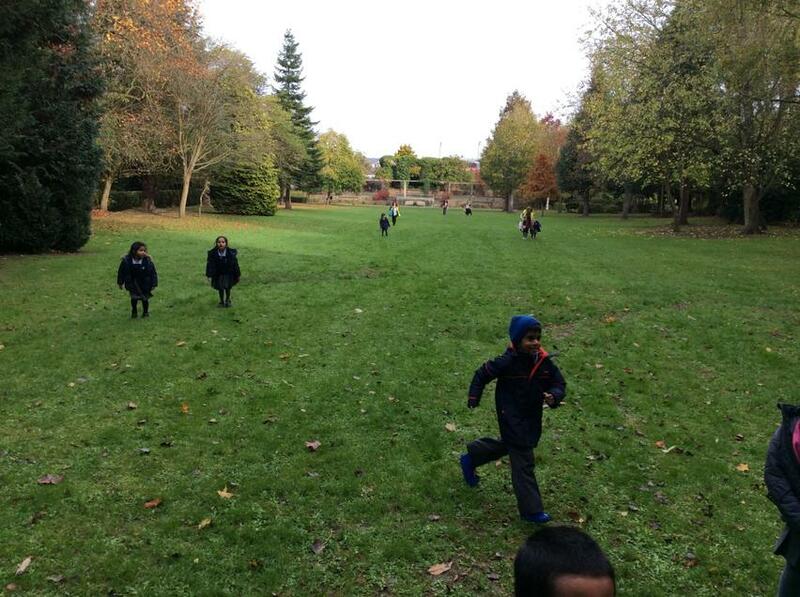 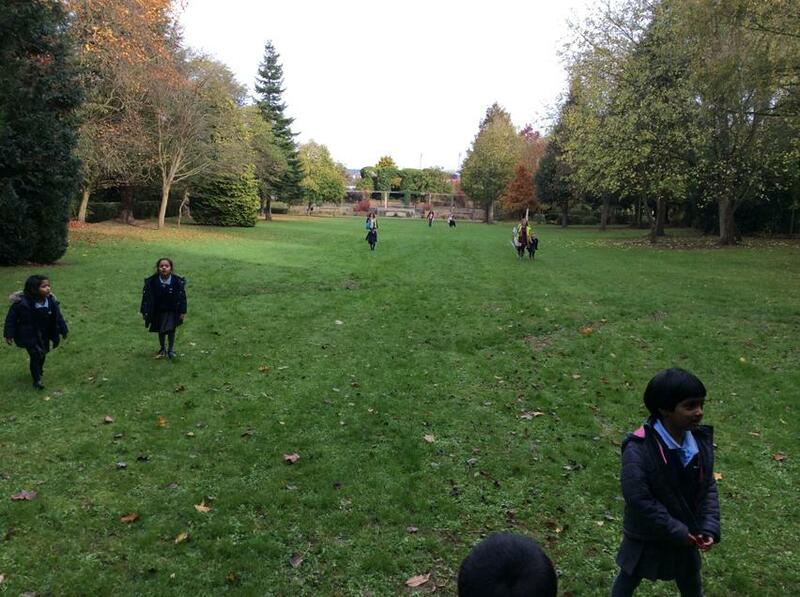 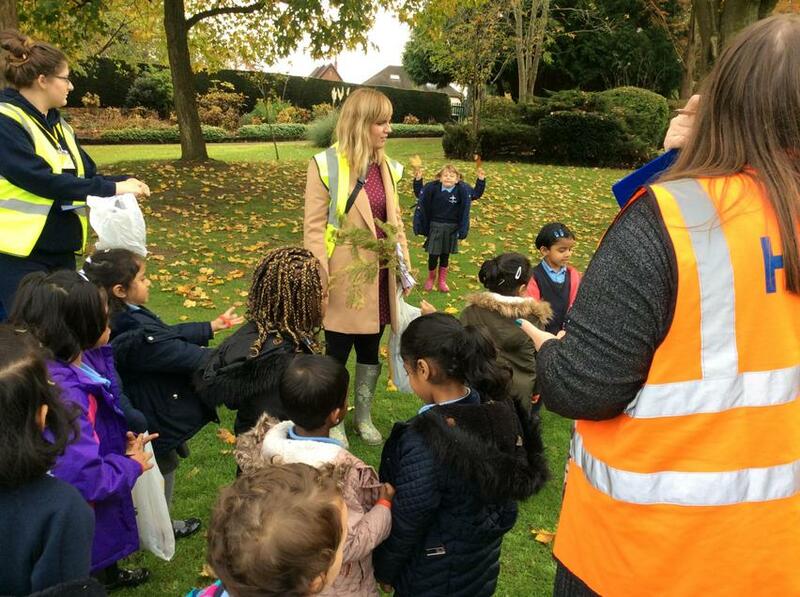 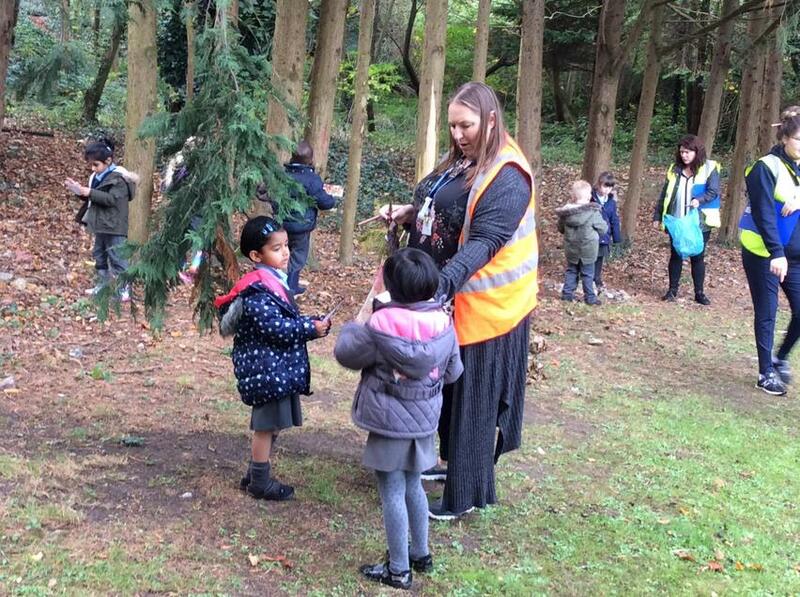 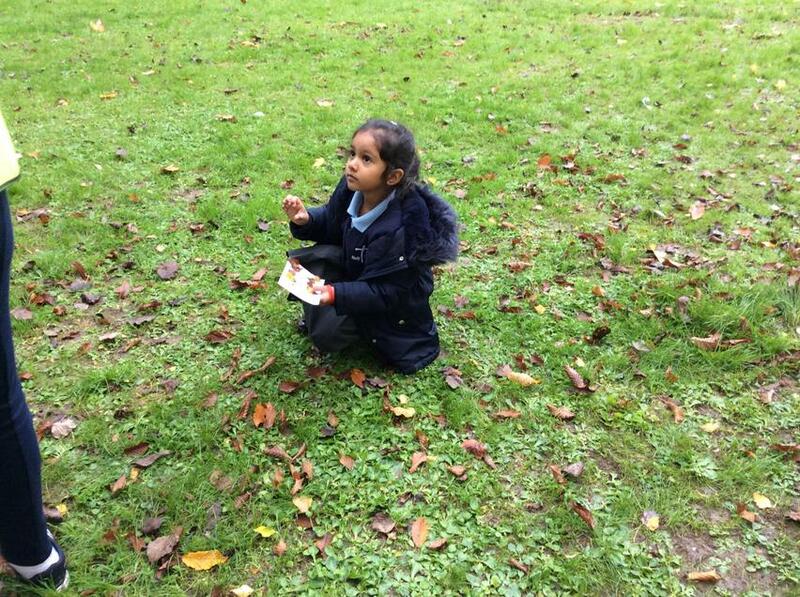 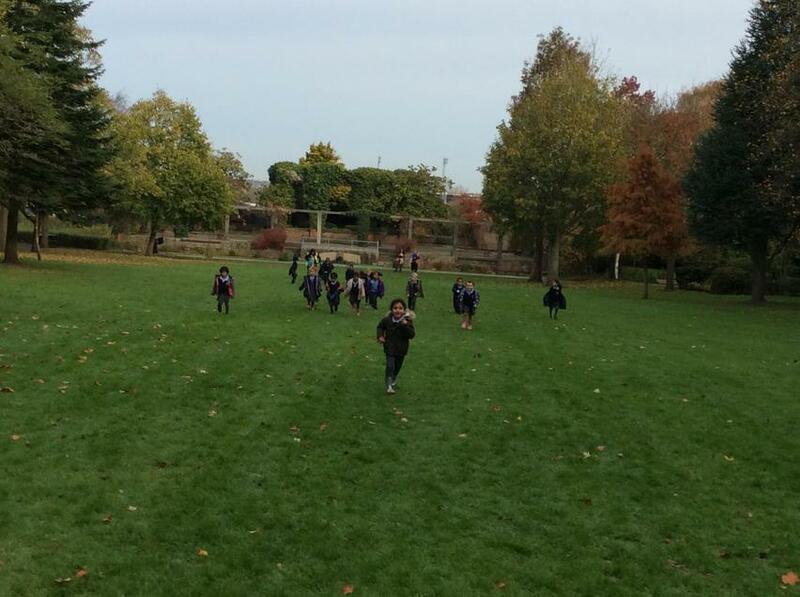 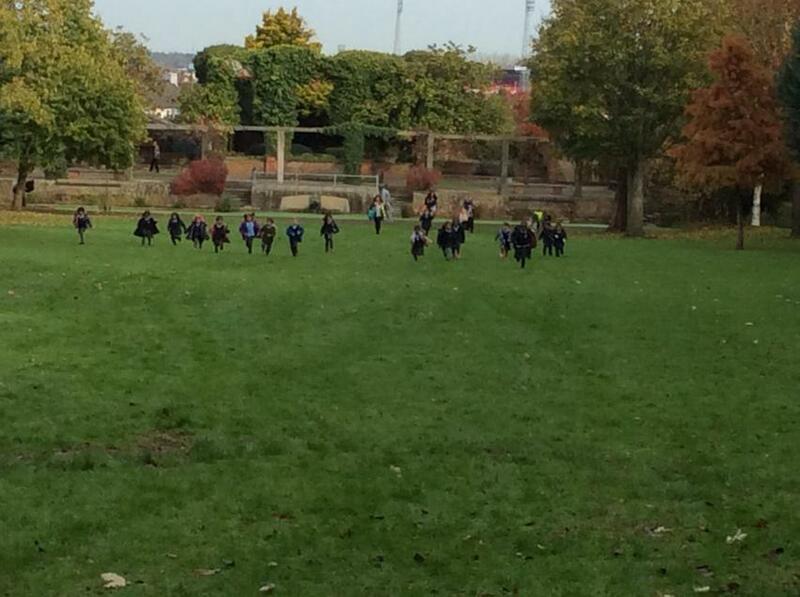 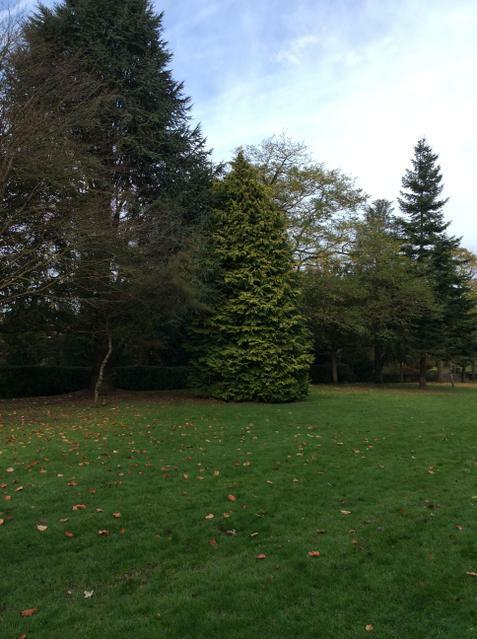 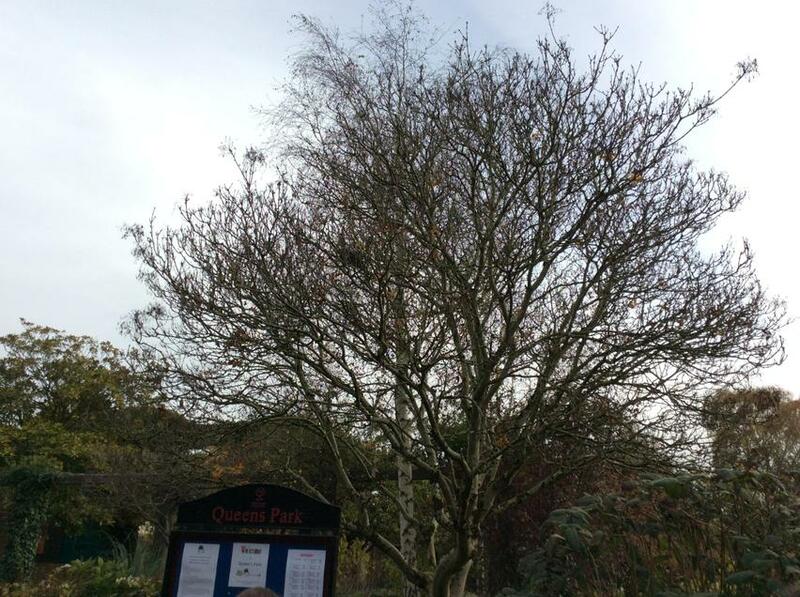 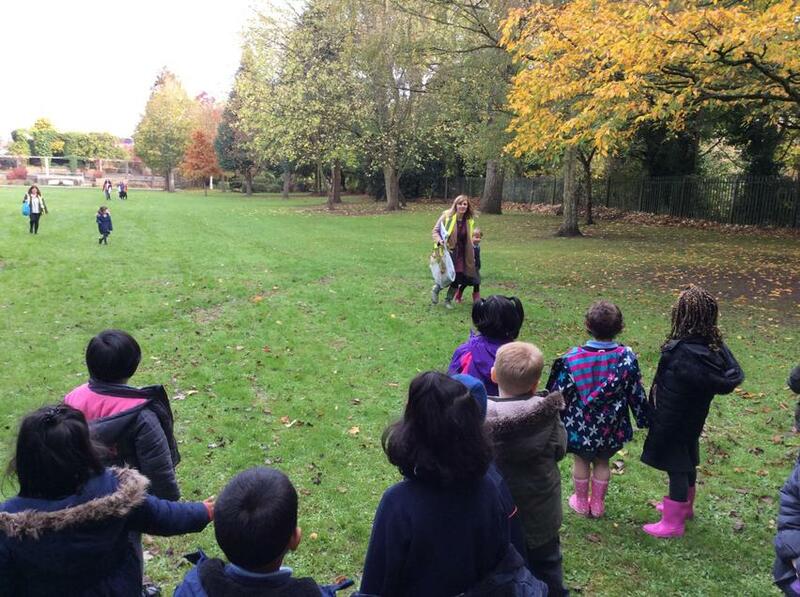 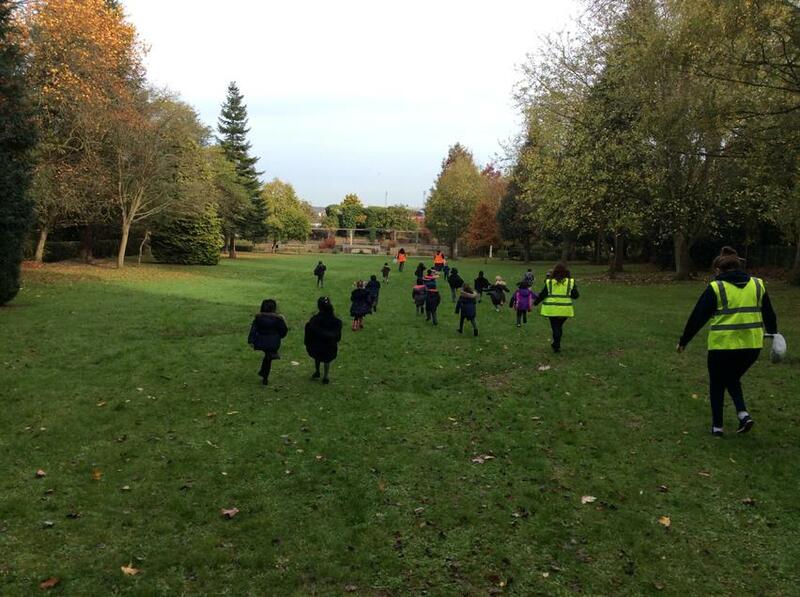 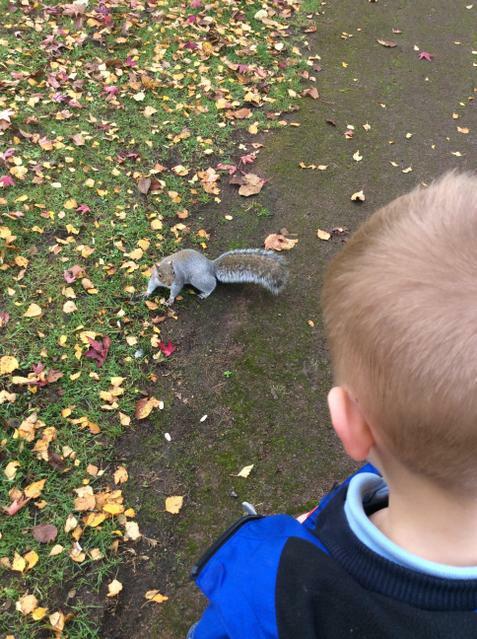 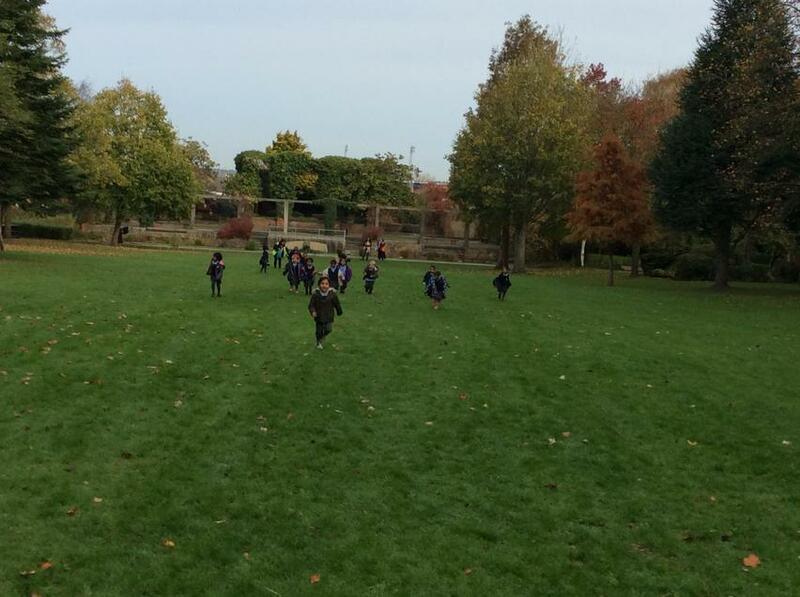 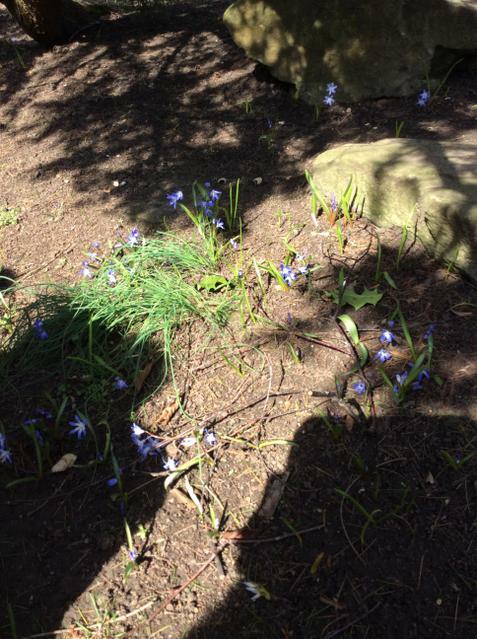 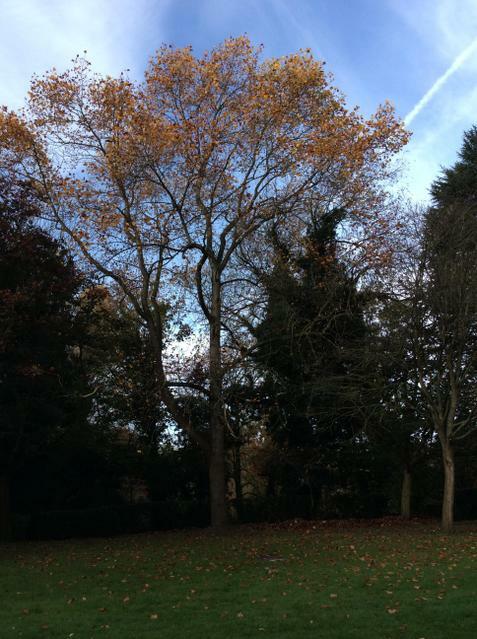 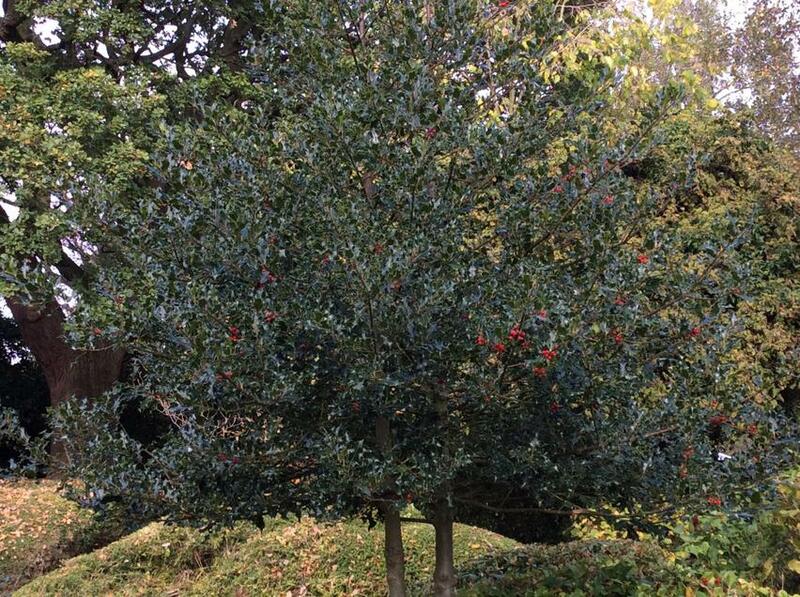 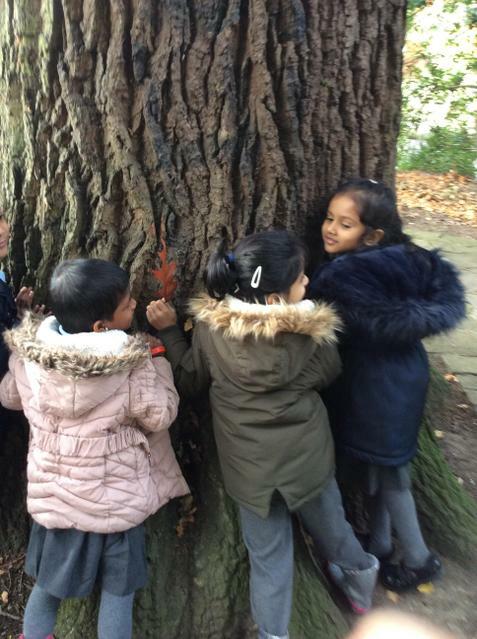 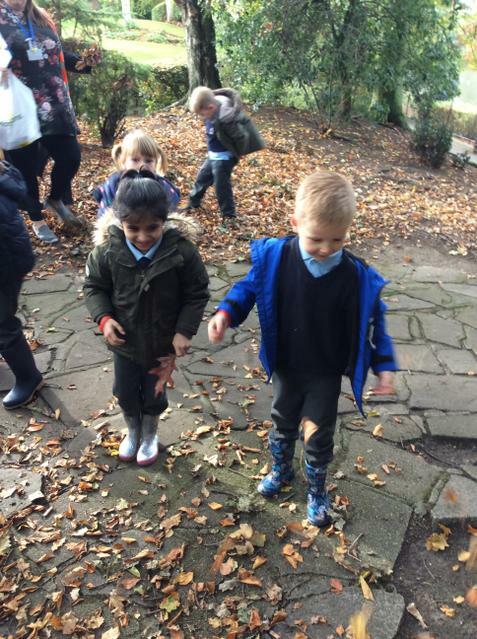 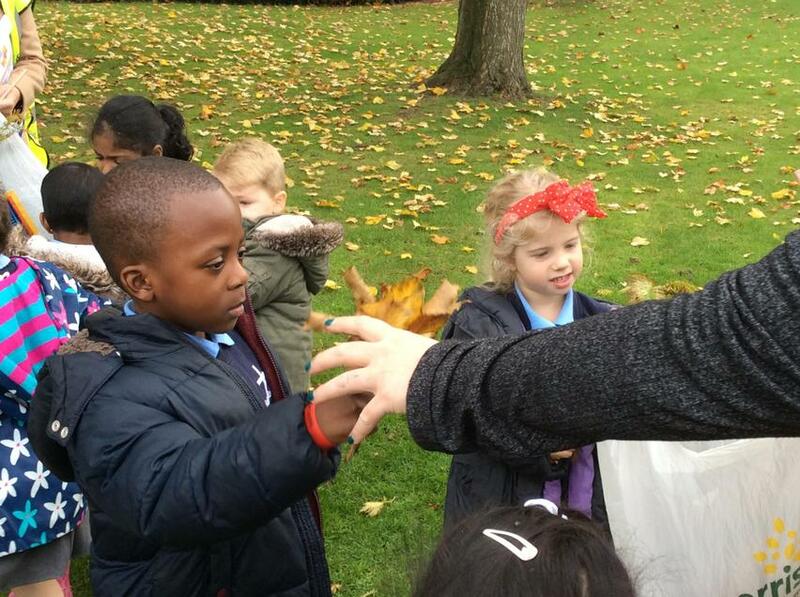 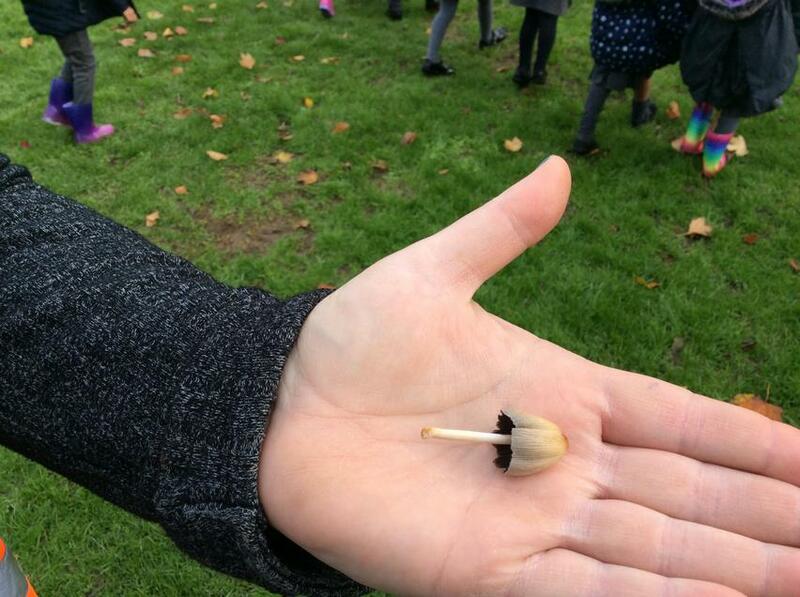 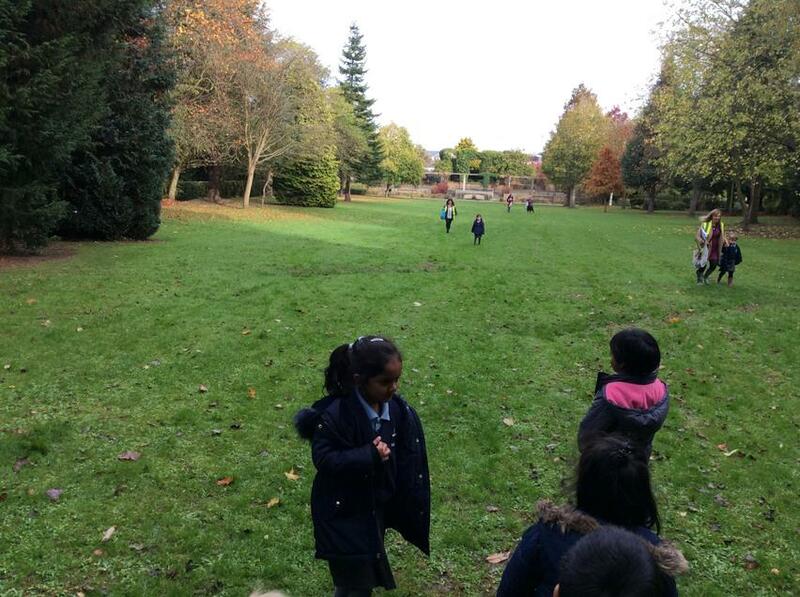 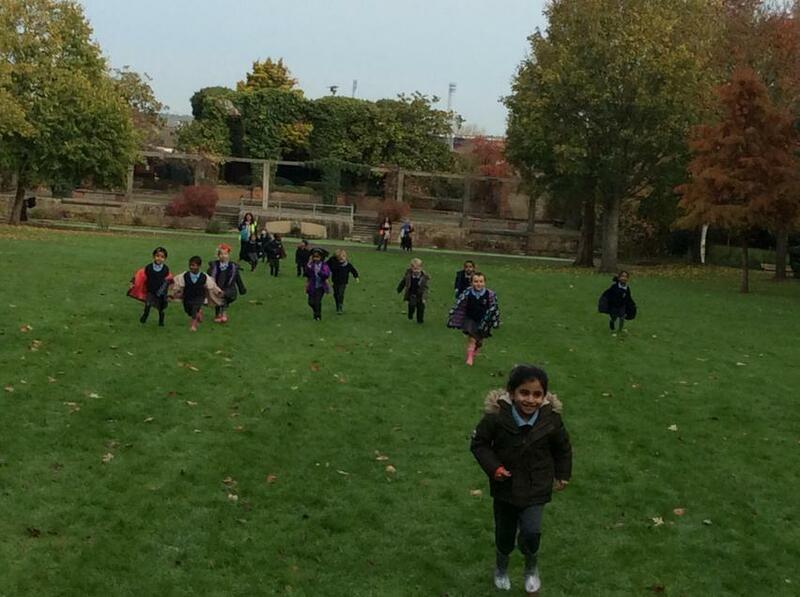 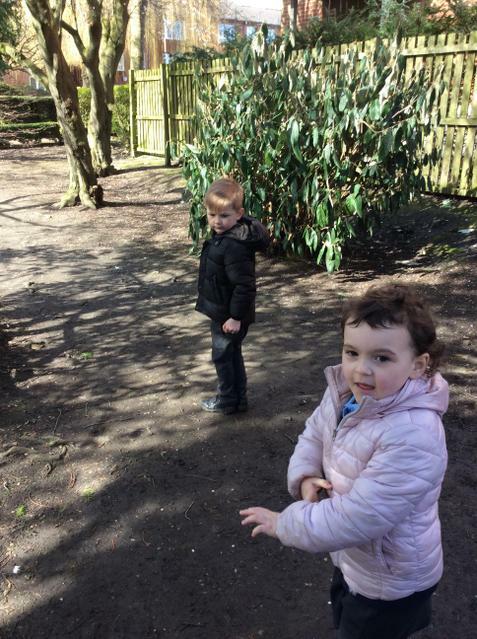 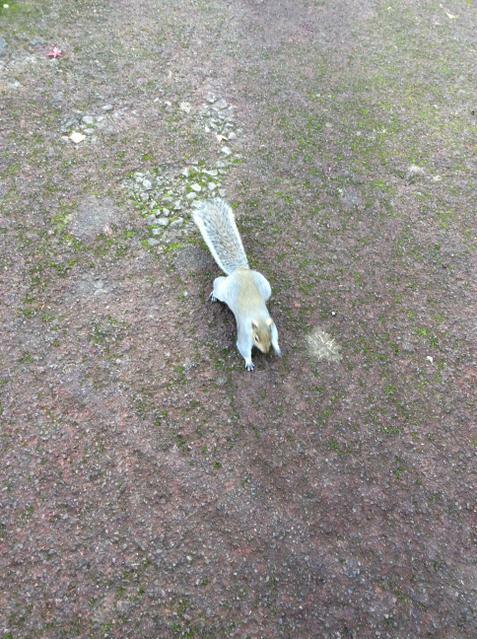 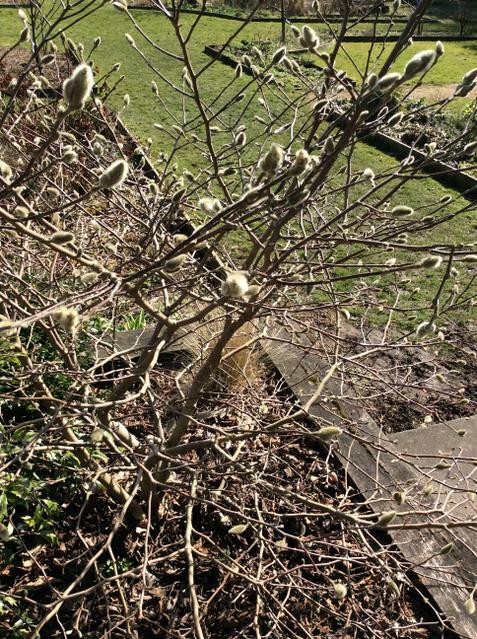 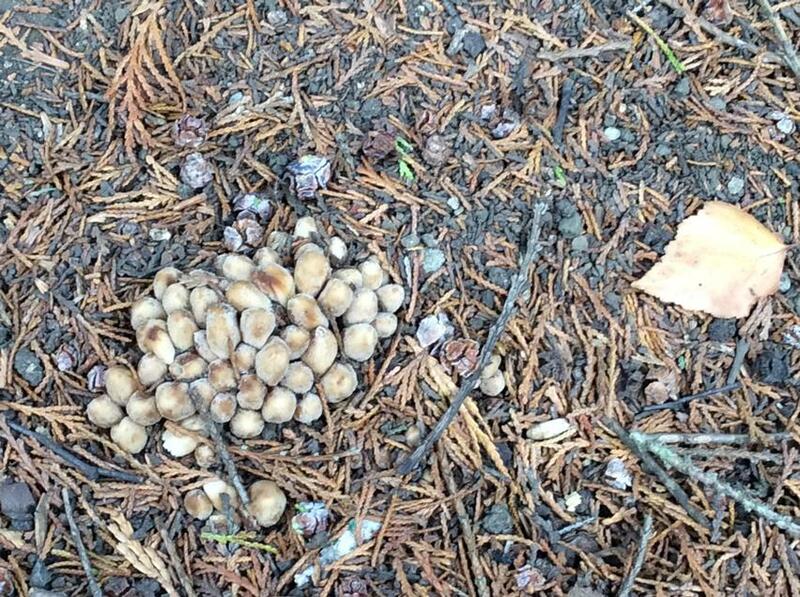 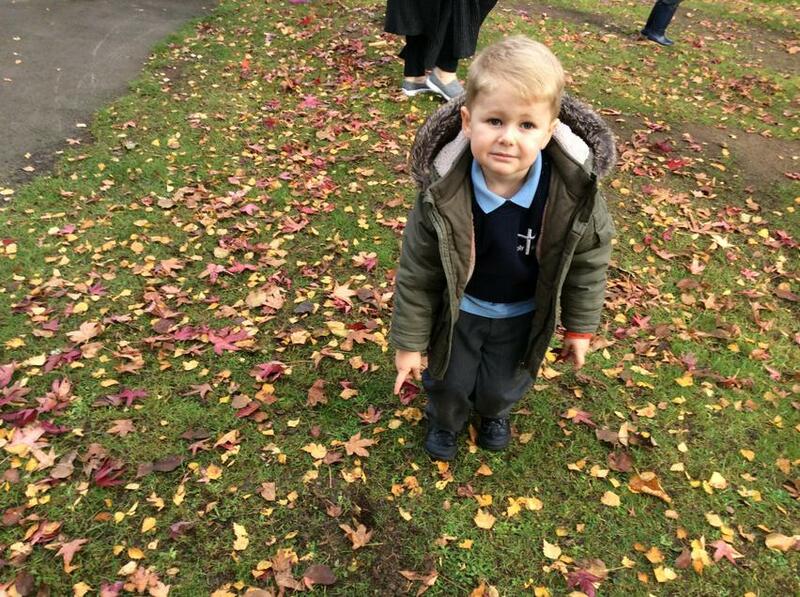 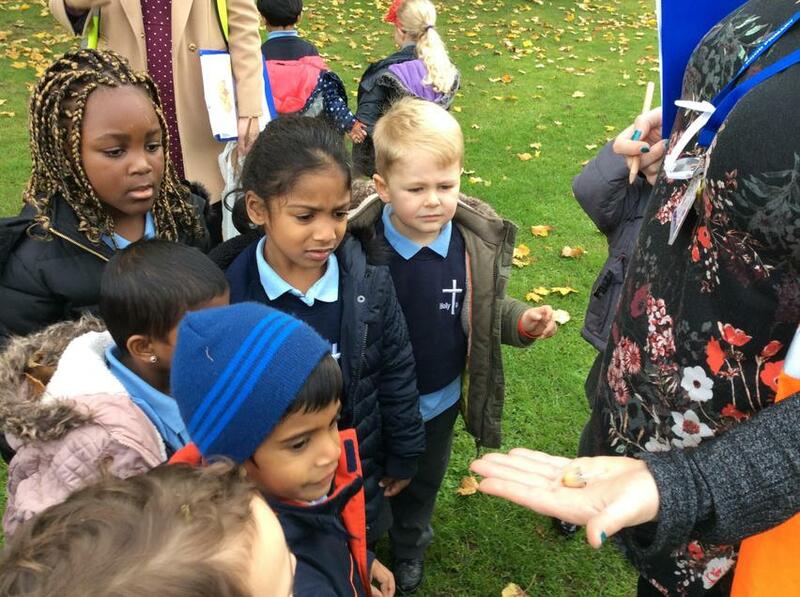 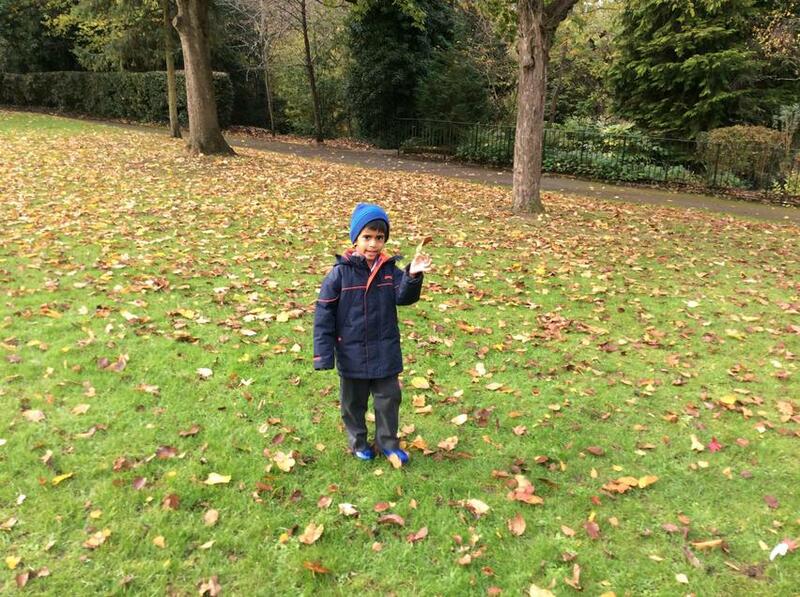 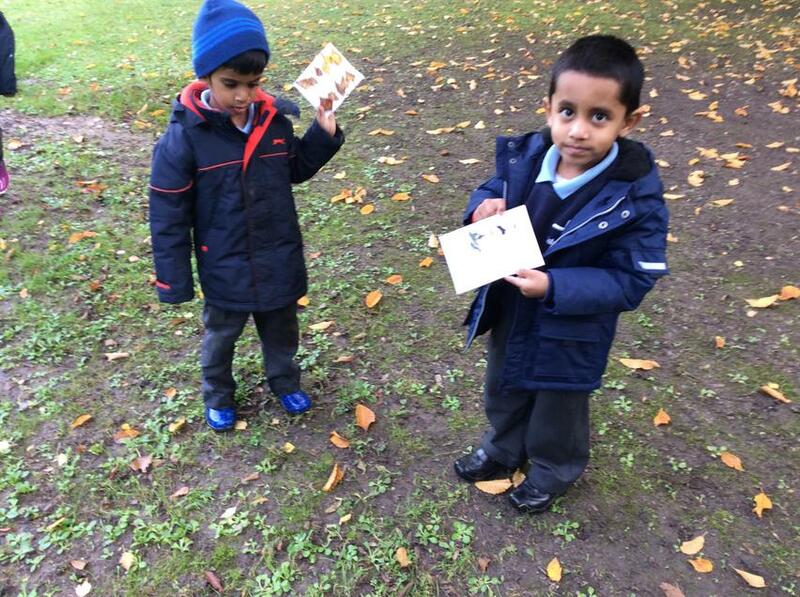 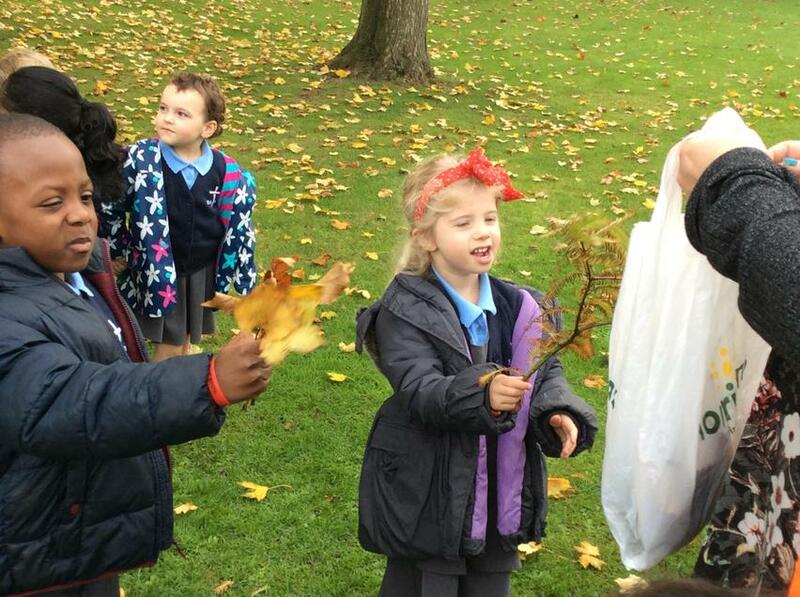 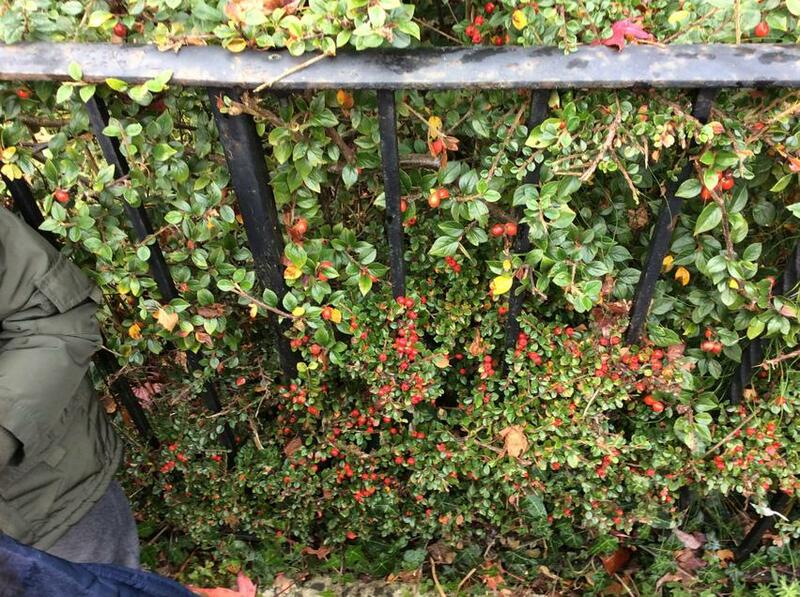 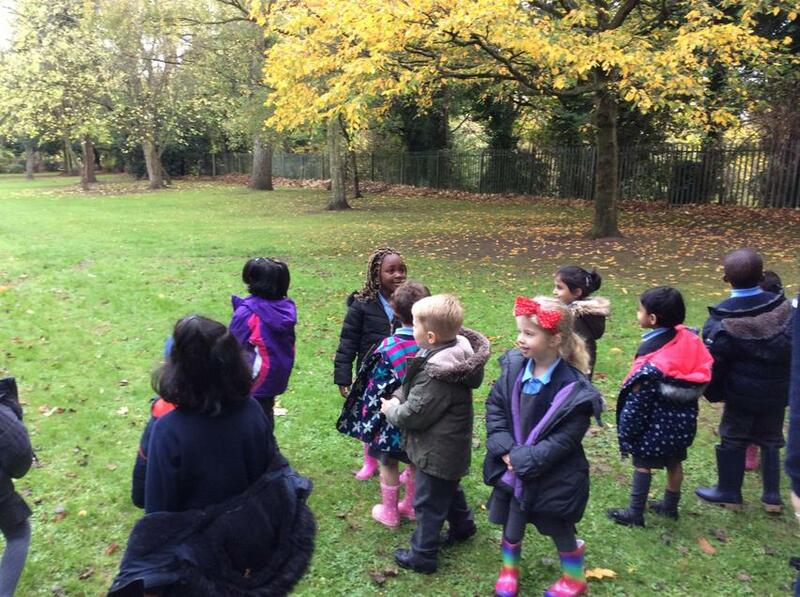 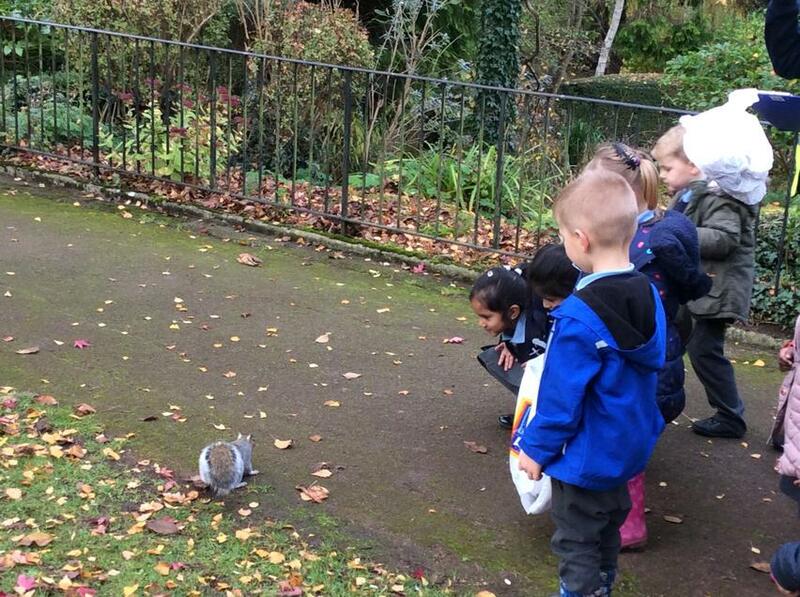 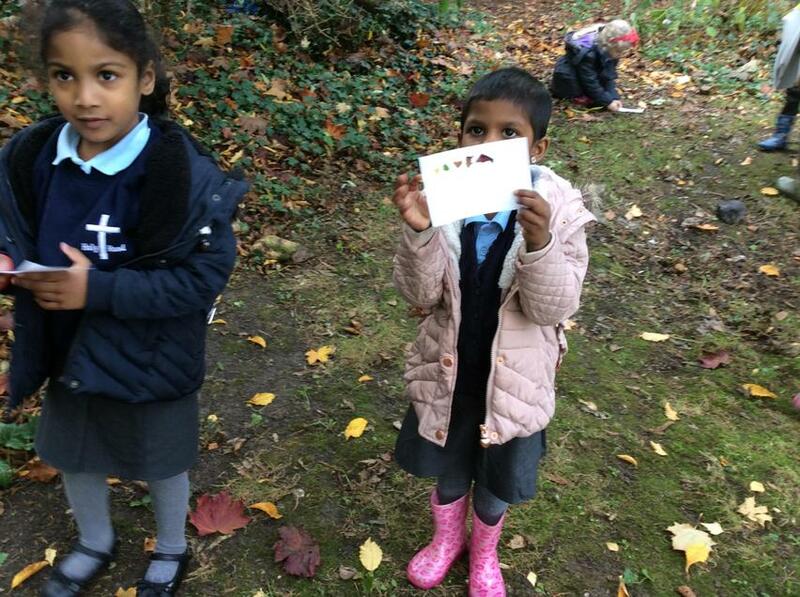 We went to Queens Park to look for signs of Autumn. 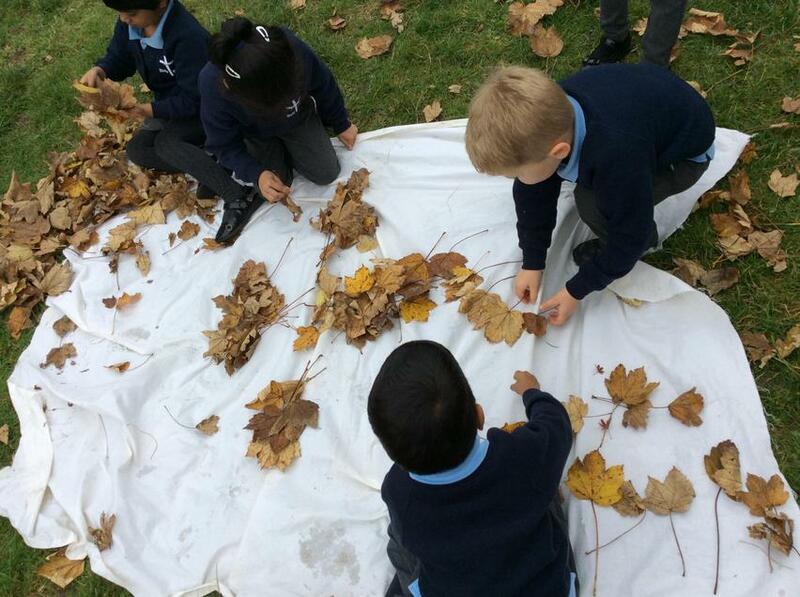 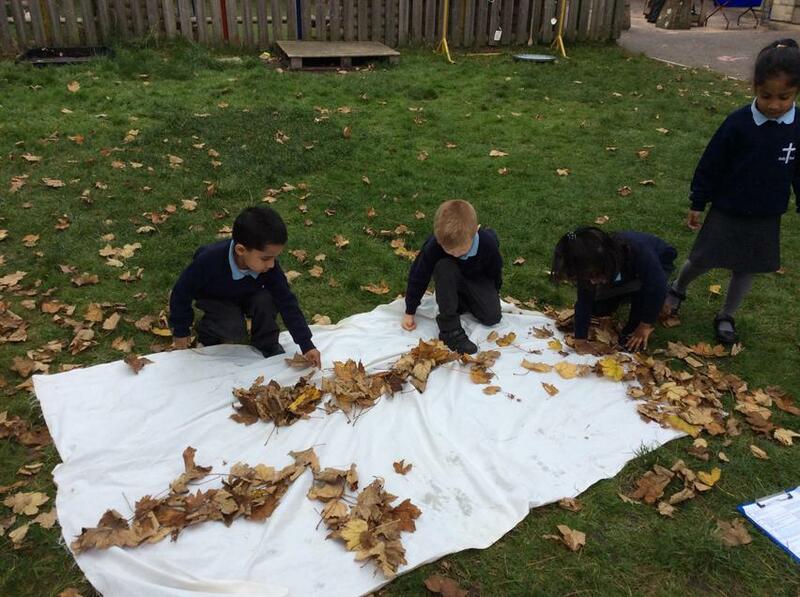 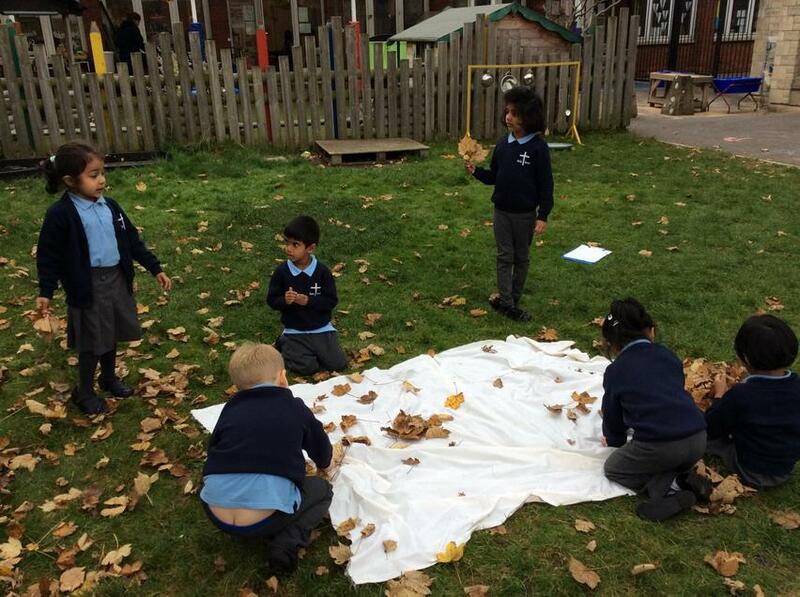 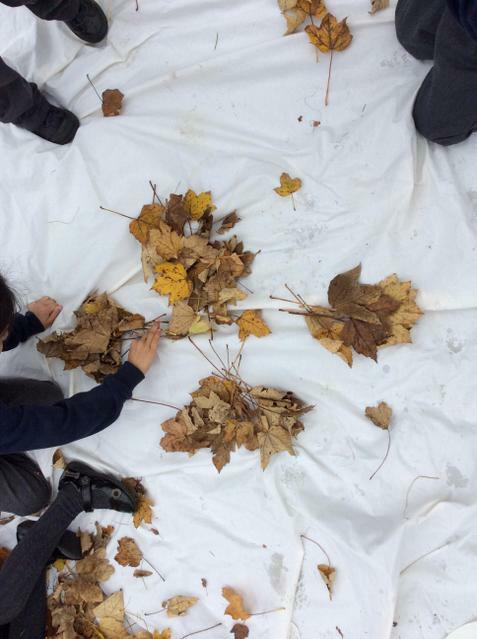 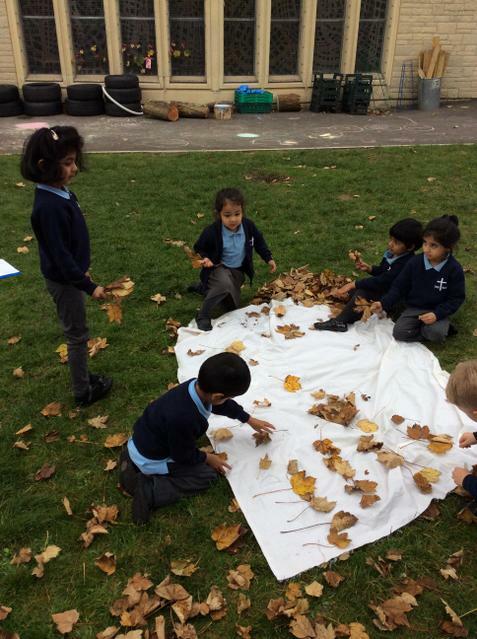 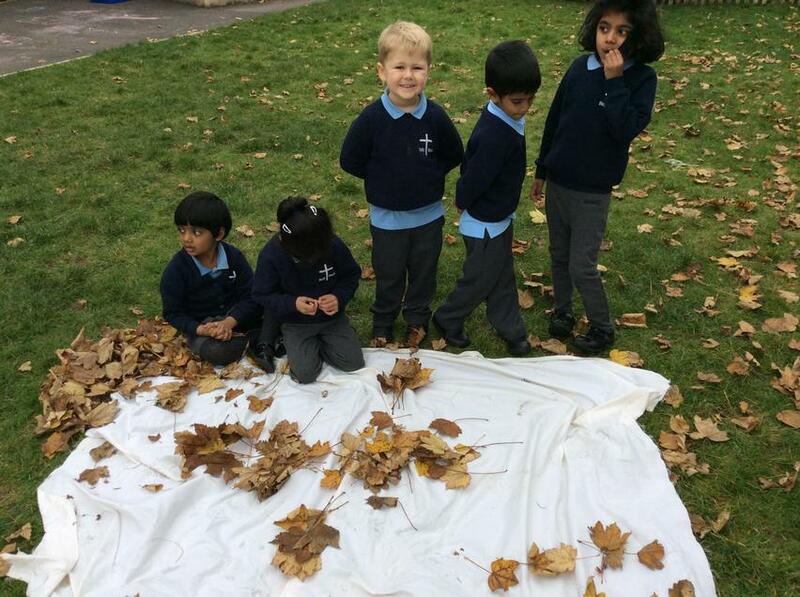 We made autumn collages using different coloured leaves.